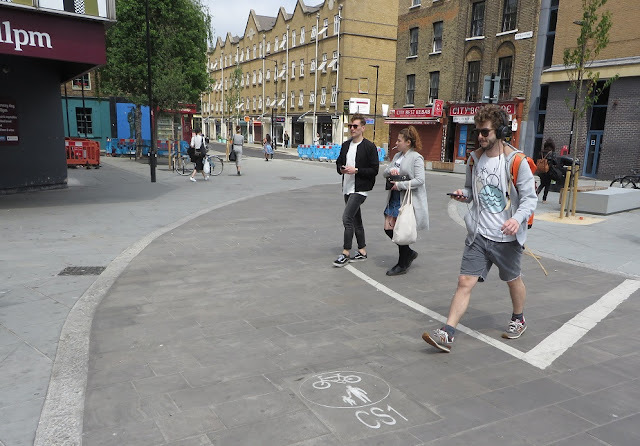 Tower Hamlets Council are currently consulting on proposals for their section of the quietway 6 cycle route. 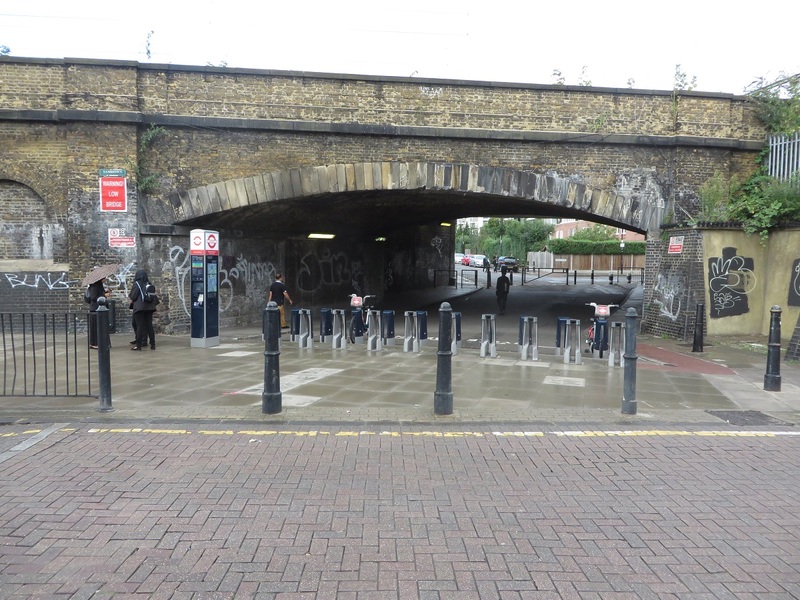 This quietway will run from Mile End to Barkingside and the section up for consultation runs from CS2 in Mile End to Hackney Wick on the eastern edge of the Tower Hamlets Border. 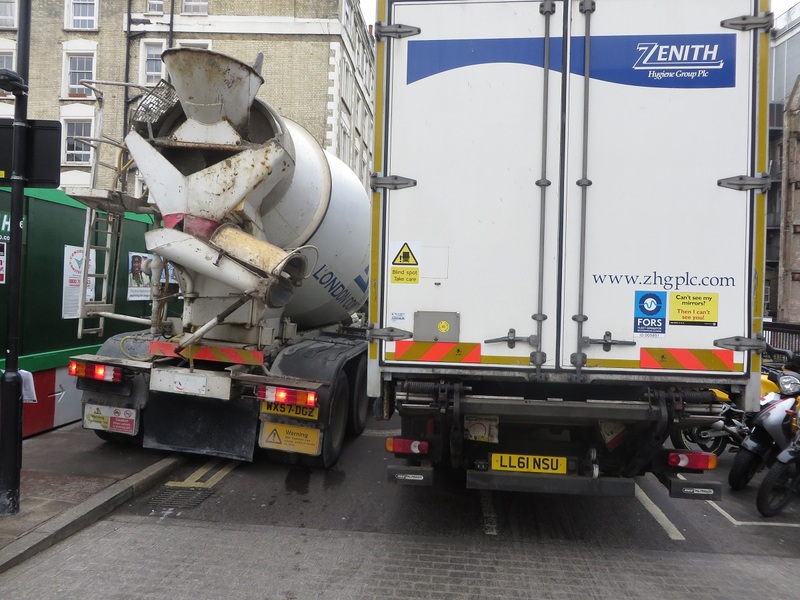 Since CS2 and CS3 were completed I have switched my cycle commute home from work and now use CS3 and CS2 instead of battling it out with lorries on Hackney Road and cement mixer trucks on Bishops Way. It takes a little longer but it has literally changed my life having a mostly stress free and enjoyable cycle home from work at the end of each day. Presently I come off CS2 at Mile End and use the Regents Canal towpath up to Victoria Park; a very pleasant journey, if a little busy with pedestrians on sunny days. However very soon Victoria Park will be closing shortly after 4pm each day and so I'll have to find another route. As Quietway 6 will run very close to my flat in Hackney Wick this route sounds perfect for me and so I cycled home along it a couple of times last week to check it out. 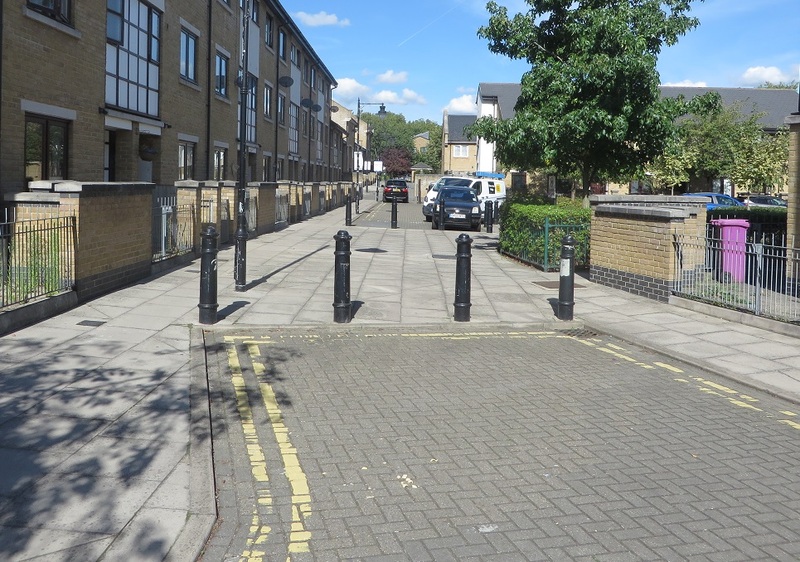 The first section of this quietway begins by turning off CS2 and left onto Bancroft Road. 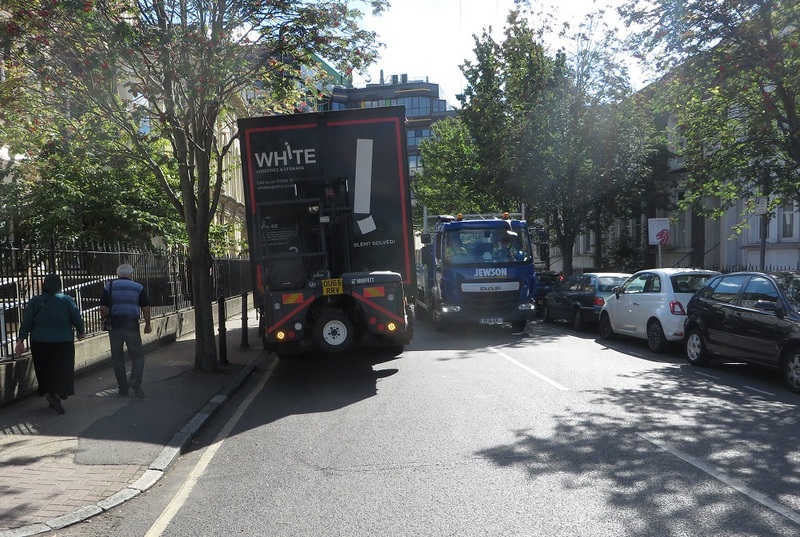 This is not a welcoming manoeuvre to make as a much more welcoming cycle track stretches out ahead of you on Mile End Road! 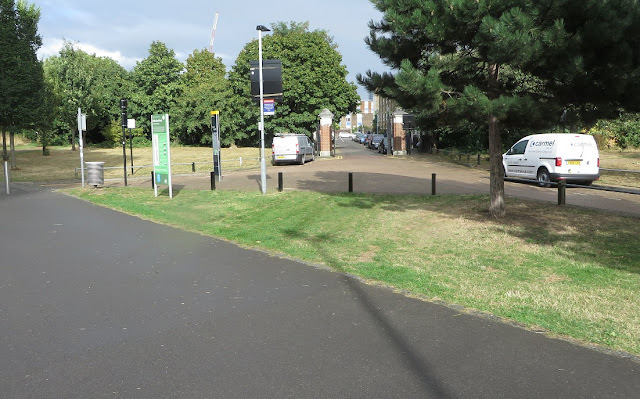 Every time I have cycled on Bancroft Road it has been busy, which is to be expected with the main entrance of Mile End Hospital located on it, Queen Mary University either side of it and, I suspect, people using it as a cut through from Globe Road to the A11. The route quickly turns left into Alderney Road, where a continuous pavement is planned across the arm of the junction giving priority to pedestrians. 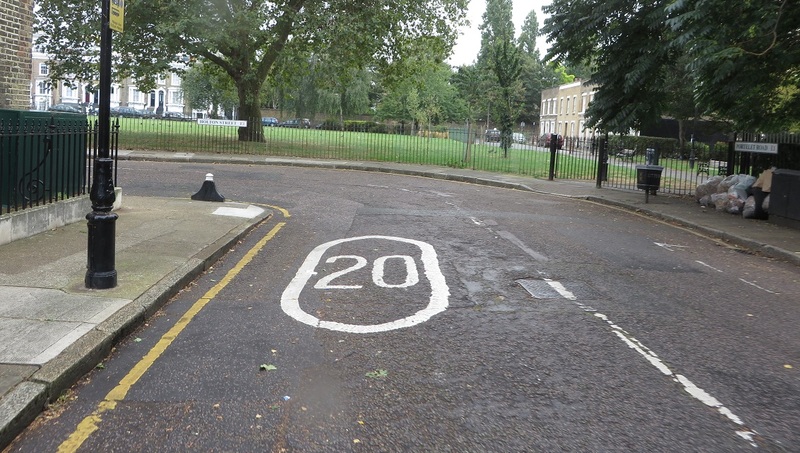 This is great to see but a shame more were not installed along the main road further south when CS2 was built. I'm also not sure why just this one side road gets this treatment in this scheme or even why this is part of a cycling scheme at all - why not just gradually introduce continuous pavements on every side road as part of every future road improvement scheme in Tower Hamlets? 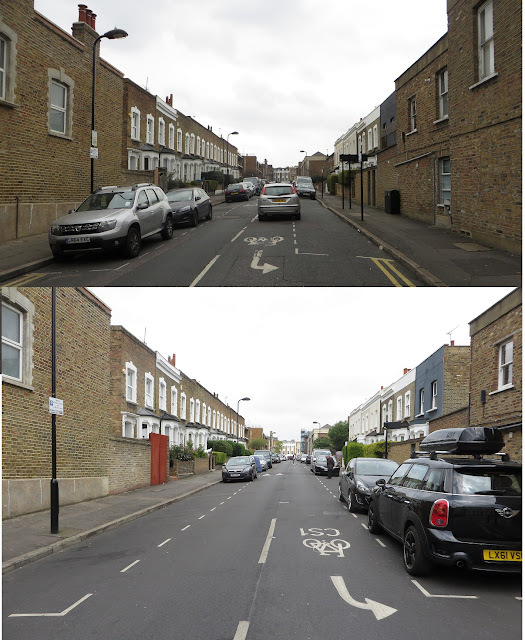 Continuing north along Portelet Road and it is interesting that in a ward where 66% of households have no car roughly the same amount of road space has been allocated for the parking of cars. Three "cycle friendly road humps" are to be installed along this road and my main experience of using these kind of humps is on CS1, which is mostly dreadful to cycle along. I did meet one speeding van but on the whole this street was fairly quiet and both times I cycled along here I saw someone having a driving lesson; a sure sign of low traffic! This area is naturally filtered as with the railway line to the North, the canal to the East and no way to cross either I would assume most people driving here will be either be a local resident or a visitor to the Hospital or University. 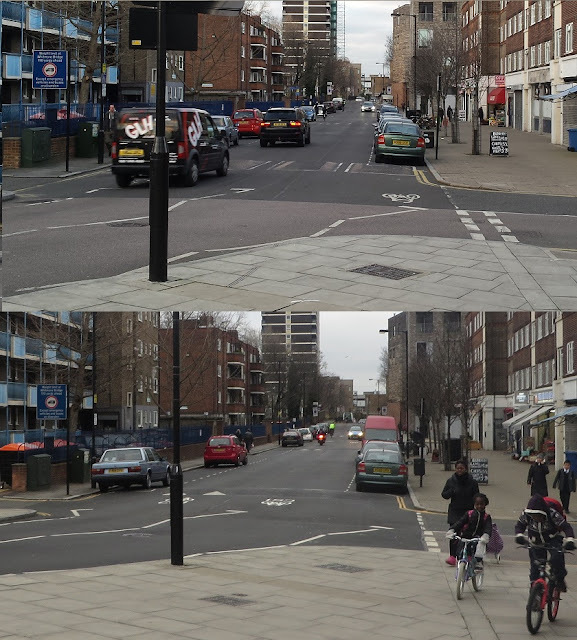 I still feel a few additional "De Beauvoir Town" style filters would help create a nearly car free area and vastly improve the area for local residents. At the end of this road Quietway 6 passes under the railway line on an already filtered road, albeit it one that is terrible to access. If I was to suggest anything here it would be that cycles using Portelet Road and the underpass get priority over the busier Bancroft Road, or even better if the northern end of Portlet Road was closed with a Tiger Crossing leading into the underpass. 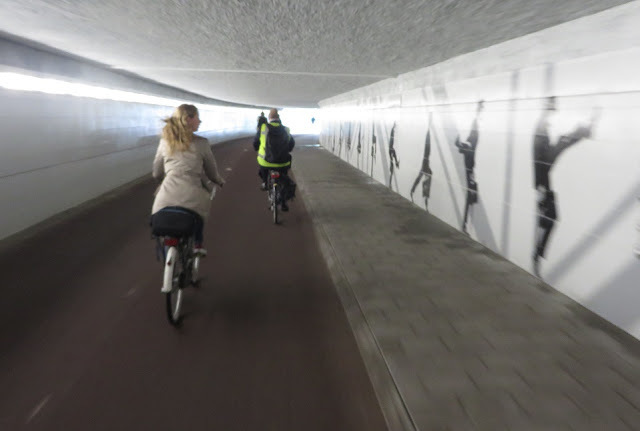 The underpass itself will get "Lighting improvements and street art" along with "a contrasting surface at same level for indicative cycle track"
The recently refurbished "Dommeltunnel" bicycle tunnel in Eindhoven featuring a clear, smooth cycle track, pavement and a John Cleese Silly walks mural. Something similar here would be fantastic! The route then takes a zigzagged course into Meath Gardens and I had to get the map out to check which way to go. I'm sure it'll be clearer with cycle way finding signs painted on it but this route does not feel direct. In Meath Gardens itself a few quietway signs are due to be mounted onto posts, along with Shared use tiles inset into the path. 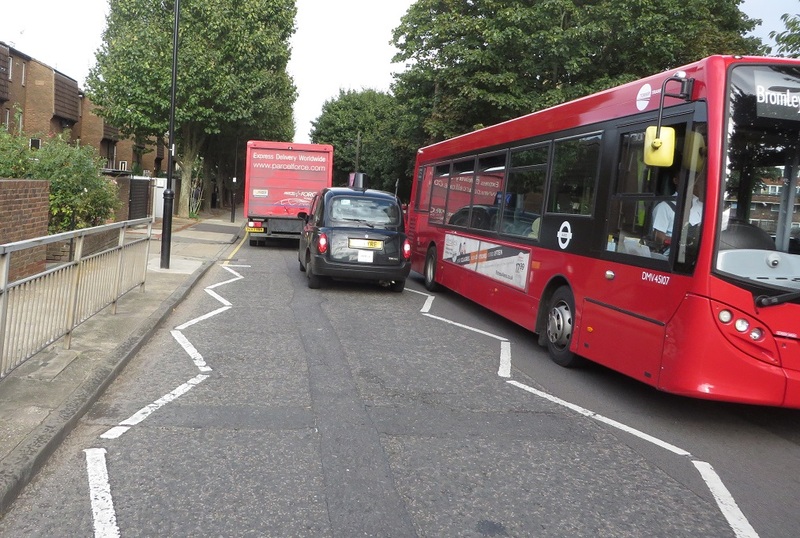 Granite rumble strips are also planed to be installed to slow down cyclists but thankfully look easy enough to avoid as the ones in Hyde Park are. The path is a little narrow here - fine for locals to walk or cycle to and from the shops or work but I feel a separate cycle and walking path would be required if this became a well used cycling route, as is the case in Mile End Park nearby. The route continues on a bridge over the Regents Canal, the same bridge Sadiq Khan used as a photo opportunity when he promised to make London a "byword for cycling" before he became Mayor of London. He is taking his time about it and four people have died cycling in London since he took office, so hopefully plans much bigger than this quietway will be announced soon. And then routed into a "hidden" part of Mile End Park; tucked away behind the climbing wall it is not visible from the main park or canal path and so most do not know it is here. 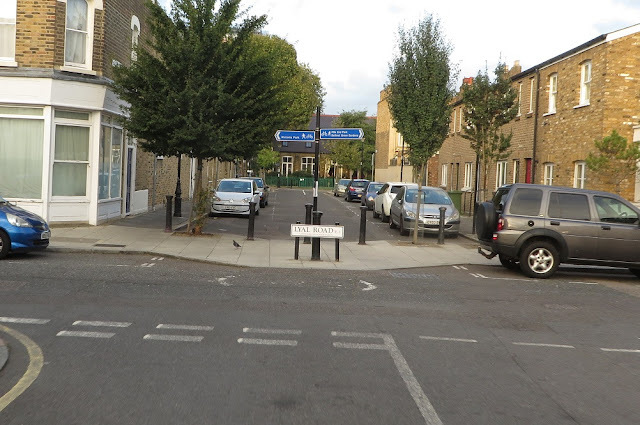 It is popular with sunbathers who want some peace and quiet but the signs warning that "Uniformed and plain clothed police officers patrol this area" makes me think this quiet and secluded part of quietway 6 is not a viable route to use after dark. The Toucan crossing over Grove Road is to be widened from 4m to 6m but you still have to hop onto the shared use pavement and then back down onto the road, an awkward manoeuvre that risks conflict with pedestrians on the pavement. I hit the button on the Toucan crossing and waited. And waited, And waited. It was nearly a full minute until the green man appeared and I suspect many won't want to wait that long and will just cross the road on red. As I waited to cross I spotted a woman and her daughter cycling along the pavement on the opposite side of Grove Road and thought, not for the first time in this journey, how resources would be better spent on building protected space on main roads like this, rather than on quietway routes. The route continues East along fairly attractive residential roads, although the majority of road space is, of course, given over to car parking. 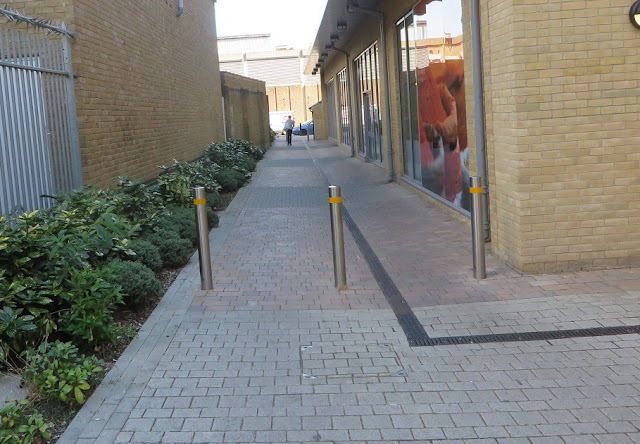 No new filters are planned and the one which has existed for many years is to be slightly improved by removing the two posts either side of the bollard. After crossing a fairly busy St. Stephen's Road I was then cycling along what felt like an entrance into an estate car park, and the sign on the road then confirmed that is exactly what I was doing. 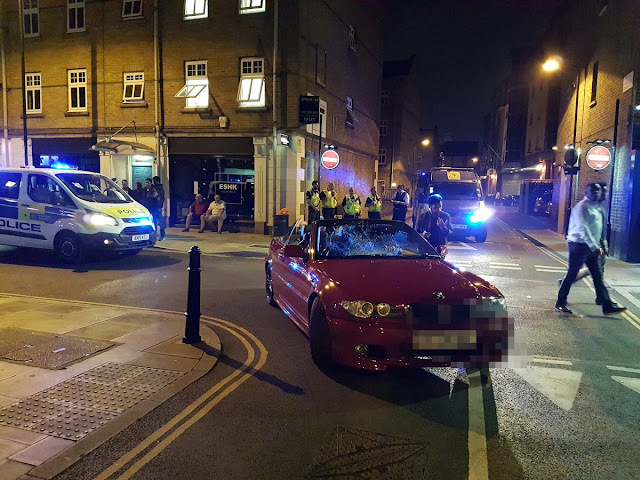 In a narrow access road alongside the car park I was eyed suspiciously by some local youths gathered around a moped and an aggressive looking dog being taken for a final dump before bed. I don't think I'll be revisiting this section again, especially after dark. The route then goes onto a shared footpath and then down Galahad Mews, a very narrow alleyway which doors from the block of apartments alongside open directly onto. Surely only a matter of time before someone is hit by a bike as they exit their apartment block if this scheme goes ahead. Had you been cycling along here a few years ago then you would have been cycling through the Safeway Supermarket car park. That supermarket was demolished some time ago and the site stood empty due to various planning issues. A new Tesco supermarket did finally open here a year ago with blocks of apartments built above it and on the car park with car parking transferred into the basement. The quietway passes between the Tesco entrance and the library, sorry I mean the Bow Idea Store, next door. The plan is to create a "waiting pocket" in the middle of Old Ford Road in order to cross it to access Sycamore Avenue, this is needed as it is a busy road and I found it very difficult to cross last week. The plan here is to paint "Large cycle logos with chevron markings, placed centrally in each lane"
This road is very busy with motor traffic all day long and I try to avoid it at all costs, as do others. This is not at all a place for those "who want to use quieter, low-traffic routes, providing an environment for those cyclists who want to travel at a more gentle pace" and no amount of centrally placed cycle chevrons will change that. The mini roundabout on Wick Lane is "to be consulted on separately" and no changes are planned at all for Cadogan Terrace alongside Victoria Park, which should clearly be filtered, particularly as the six lane A12 runs directly alongside so would hardly be an inconvenience. Every single building in this photo to the right of Wallis Road is either currently, or very soon will be, demolished to make way for bland apartments in the sky. 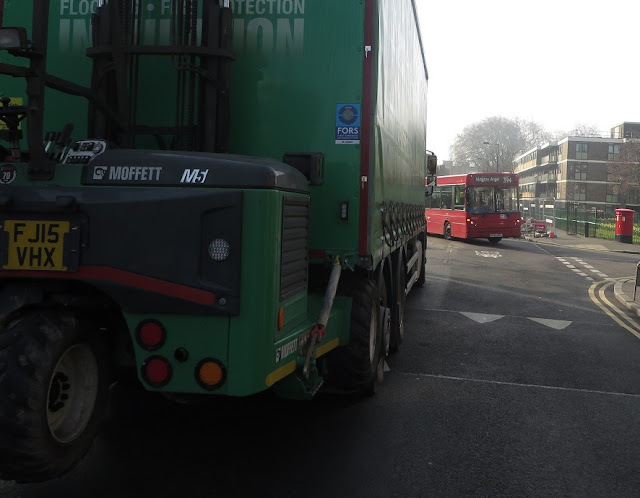 Expect an awful lot of construction lorries to be using Wallis Road over the next few years. 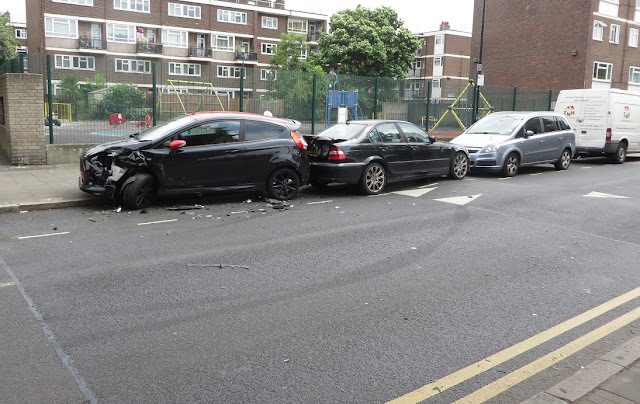 There used to be a mini roundabout here, which was removed just prior to the Olympics in 2012 and so it seems a shame to be spending money altering the layout of this junction again after just a few years. The road is very narrow under the bridge and I've lost count of the numbers of times I've seen buses almost collide here. Once past this bridge you're in the London Borough of Hackney, where the quietway will continue into the Olympic Park into Newham and beyond, to be consulted on by different boroughs. 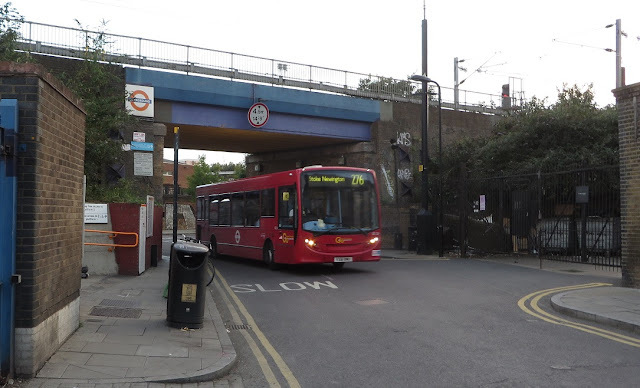 To cycle from CS2 to this railway bridge using the quietway route was about three miles, whereas had I travelled my usual route it would have been just under two miles. 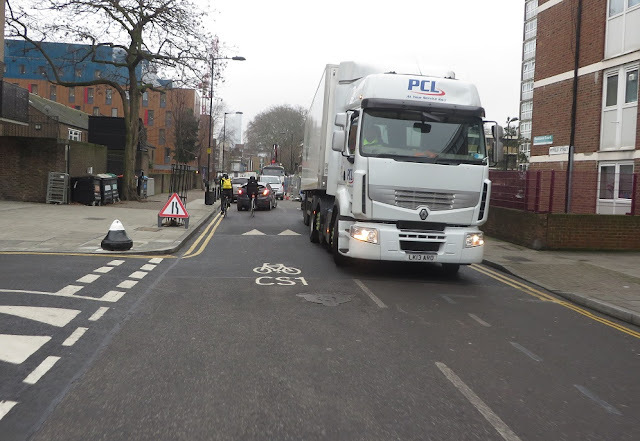 Ironically it also would have been a much quieter route along segregated cycle lanes, canal tow paths and Victoria Park and no interaction with concrete mixing lorries. Which leads me onto the question of why this quietway is being proposed at all? There are no real interventions here, it is mainly just adding signs onto some back streets. 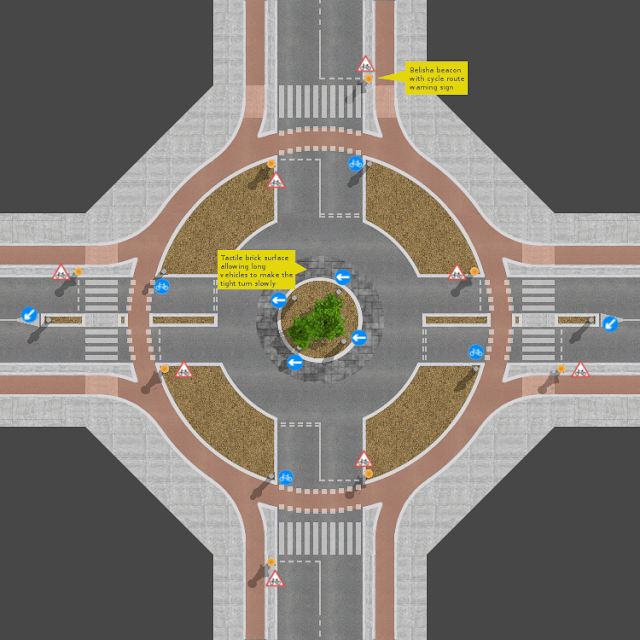 No filters or traffic reduction is planned and the roads will all stay the same as they are now, except for some reshaped speed humps. 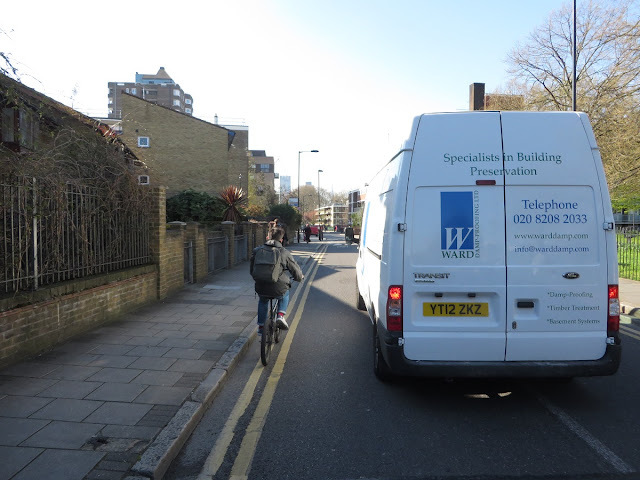 Almost every single street is too busy for children to cycle down and families won't be riding on this quietway when it is completed, just as they aren't now. 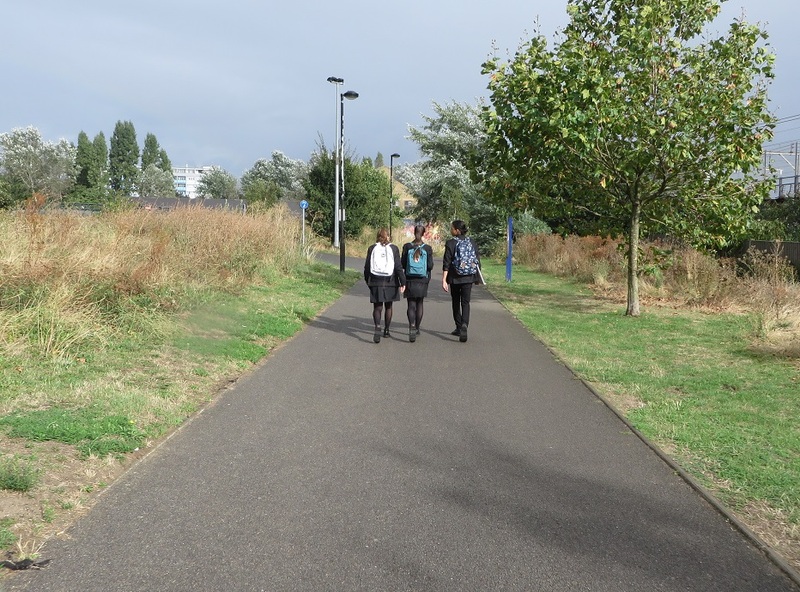 "Quietways are a network of high quality, well signed cycle routes throughout London which run along quieter streets, parks and other off-road routes across inner and outer London. The routes will link key destinations and are designed to appeal to people new to cycling and those who already cycle who want to use quieter, low-traffic routes. 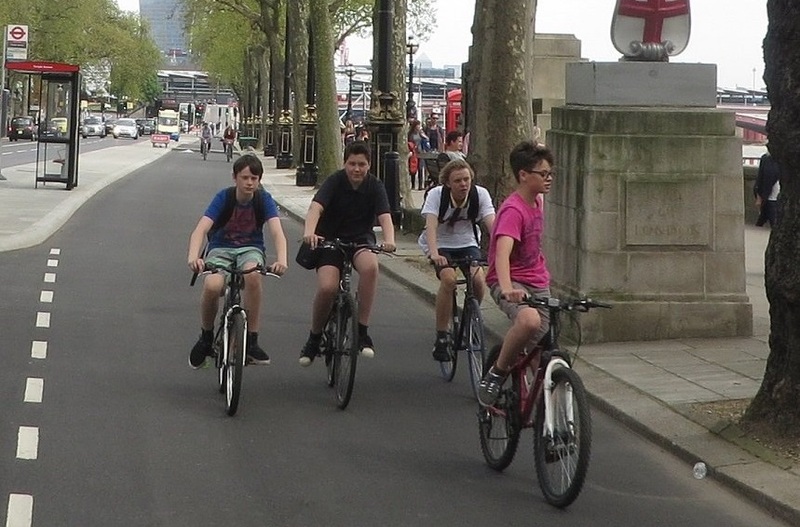 Quietways will complement other cycling initiatives in London, such as the Cycle Superhighways." Yet very little of that is true when you experience this route on a bicycle. In their cycling strategy the council commit to building segregated cycle tracks along Grove Road, linking CS2 with Victoria Park. This is exactly what is needed, along with either a later opening of Victoria Park or segregated cycle tracks on somewhere like Old Ford Road (which would need to be made one way for motor traffic to achieve this). 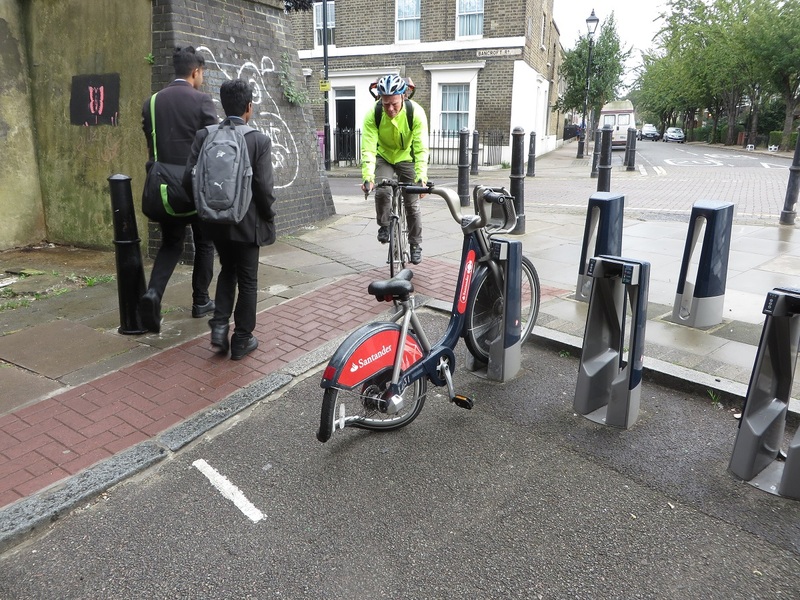 Tower Hamlets Council should be concentrating on building networks and grids along main roads, where people want to go and building cycling routes that connect some of the already excellent routes that exist. 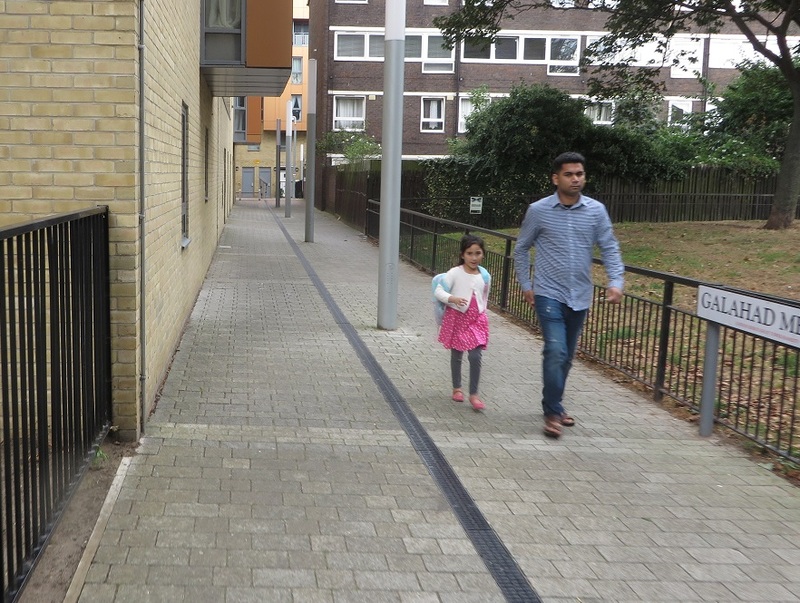 Filtering residential roads and building continuous pavements should continue as part of a programme to create better streets for all residents with the added benefit of giving children the option of cycling from their home onto a main road nearby where cycle tracks are available. 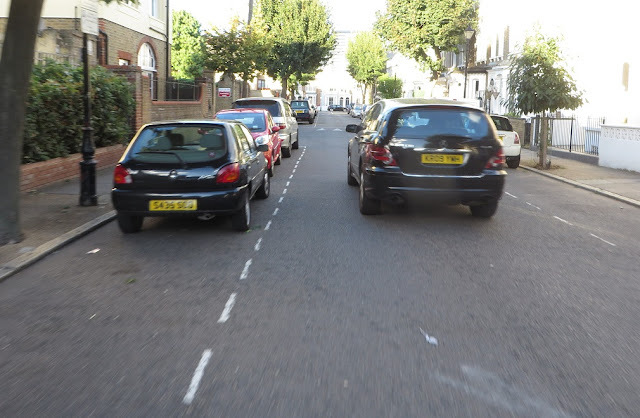 Quietway 6 just feels like the council have been given the funding and told they must produce a quietway in their borough. A real waste of resources. The consultation closes this Friday 30th September. Please respond here. Last year Transport For London consulted on plans for Cycle Superhighway 1, which I looked at in detail at the time. Construction started almost exactly a year ago and I had always assumed it was due to be completed before Boris Johnson left office, just as the other Superhighways consulted on around the same time were. According to the TFL road modernisation page CS1 is listed as "delivered in April 2016", which is also reiterated in this TFL press release but as you'll see in this post it is far from finished according to the original consultation, although no works have taken place on it since around April. I ideally wanted to wait until it had been fully completed before reviewing it but as it looks like it could be many months, or perhaps even years, before all construction work is completed I'll review it as it is now and then try to come back and write about any more sections that are completed at a later date. Although Cycle Superhighway 1 was a TFL consultation and paid for from the Mayor of London's "cycling vision" budget the Hackney section of CS1 was designed by Hackney Council and delivered by its contractors. The only change that was planned for the start of the route (or end, depending on which way you're travelling) was for "Signs to highlight the start and end of CS1". A symbol of a bicycle with "CS1" written under it does now exist, painted onto the road at the beginning of Wilson Street (the first of many along this route). A new sign stating that this is Cycle Superhighway 1 is also attached to the lampost informing you that Hoxton (roughly half a mile away) is a 5 minute cycle, cycling to Dalston (around two miles) will take 13 minutes and it is 35 minutes to cycle to Tottenham (nearly five miles away). Therefore the assumption is that you'll be travelling at an average speed of between 8 and 11mph along here; I would personally have preferred it if these signs displayed distances rather than times as obviously not everyone cycles at the exact same speed. 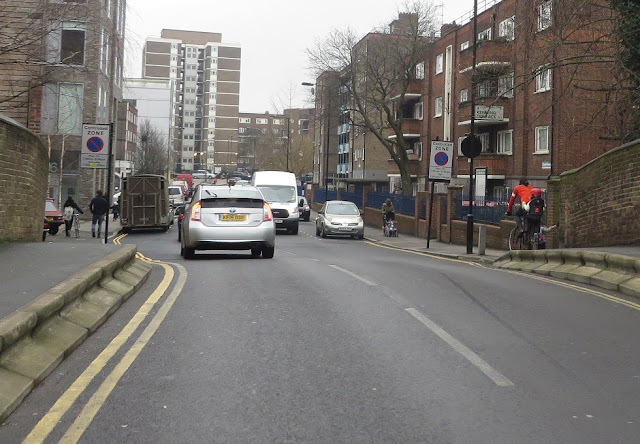 Despite the promise there is no sign to mark that you have reached the end of CS1, just an ASL at a busy crossroads in the city with no indication as to where to go next. Assuming you want to travel west into the City or the West End then your choices are to either carry on to the end of Wilson Street where you'll eventually end up on either London Wall or on Moorgate, both very busy, hostile streets with no cycling provision provided, despite their widths. The most popular option is to turn right into Finsbury Square and a very unpleasant squeeze through three lanes of traffic and parked cars; a route I used to take everyday and am thankful I no longer have to. Although hopefully Islington Council will provide some much needed cycling infrastructure here one day in the near future. Or perhaps, like the City of London, they won't. 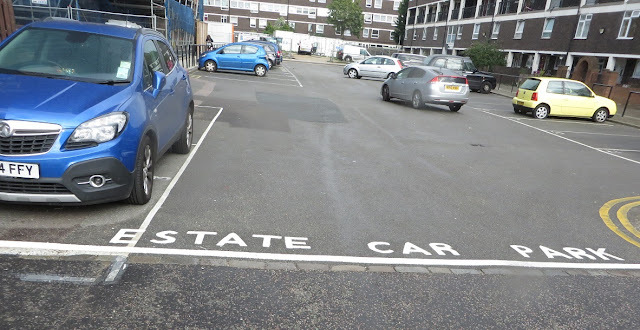 But none of this has happened, although the road has, bizarrely been resurfaced with the car parking spaces that were meant to be removed repainted alongside "CS1" signs on the carriageway. There was nothing in the response to the consultation to declare that this scheme would not happen so not sure why this has not been constructed as detailed or why CS1 is listed as "delivered" on the TFL website when there are clearly some fairly major omissions. 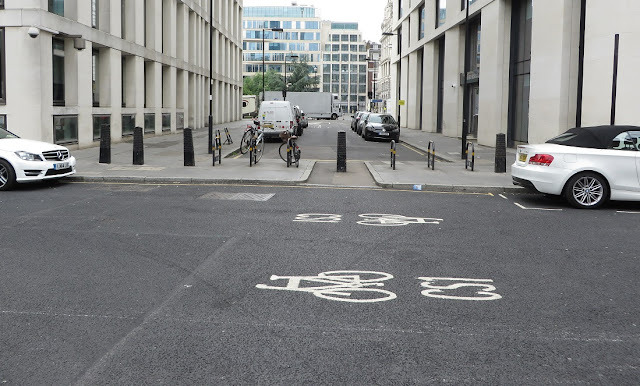 In the response to this consultation it was declared that they would "remove the bollard from the junction between Wilson Street and Christoper Street, improving access to Finsbury Square for cyclists" but this still hasn't been done, despite seeming like quite a simple piece of work to do. When I looked at this scheme last year I suggested that CS1 should take priority over Worship Street but unfortunately this was not considered and so it remains difficult, and indeed dangerous, to cross the road on a bicycle here due to it being a very busy rat run that taxis and lorries use between the ring road and Moorgate, rather than use the Old Street roundabout. 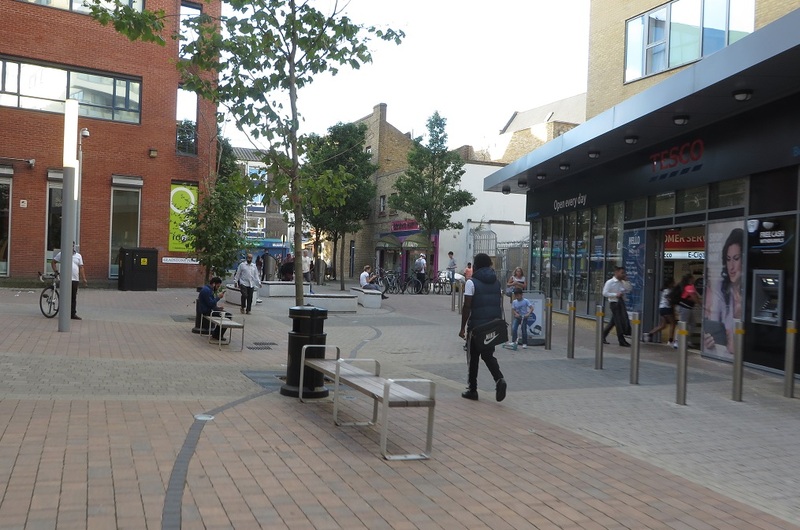 No changes were ever planned for Leonard Circus as Hackney Council spent half a million pounds turning this into a "Dutch" shared space junction a few years ago. It could actually be quite a nice area but it is totally dominated by motor traffic. All of the cages protecting the trees have been hit and replaced (some several times) due to drivers crashing into them. Perhaps time to put cages around the cages to protect the cages? Despite the claims I've never seen anything like this in the dozens of cities, town and villages I've visited in the Netherlands. I certainly can't imagine "anyone of any age" cycling here and it must surely be awful for visually impaired pedestrians. Paul Street was meant to be resurfaced and parking again restricted for five hours a day between 7-9am and 4-7pm but neither of these happened (again you can park here for free until 8.30am) and it remains a super-lorry-park-way. 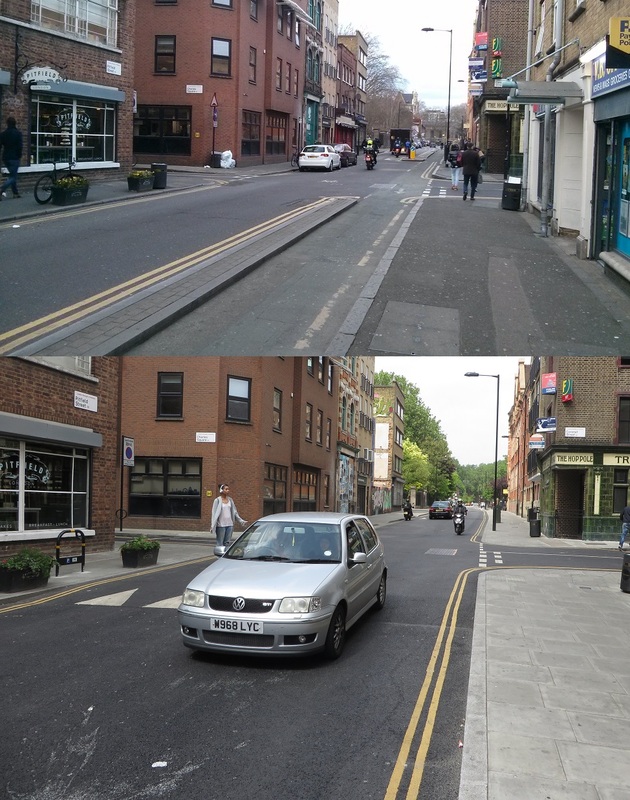 In the original consultation the road that links Tabernacle Street to Paul Street was to be turned into another "shared space for motor vehicles, cyclists and pedestrians". 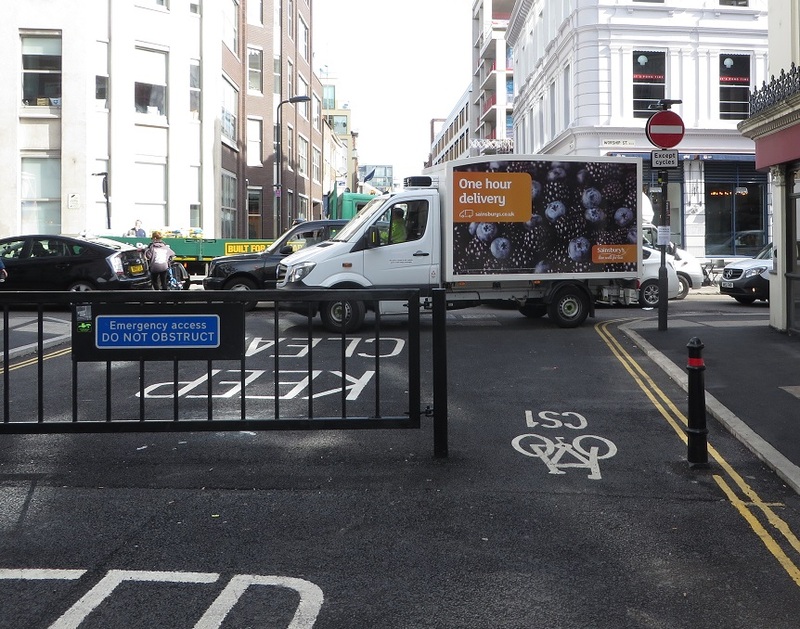 However it was stated in the consultation response that this would "no longer be implimented as part of CS1 due to this being a traffic management route for developments currently under construction in Shoreditch." 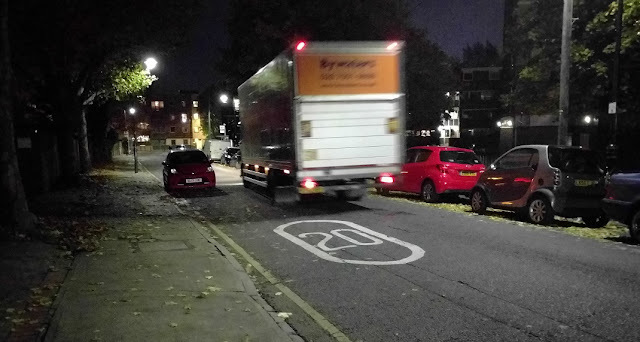 Which basically explains why this area is packed with lorries at peak times. 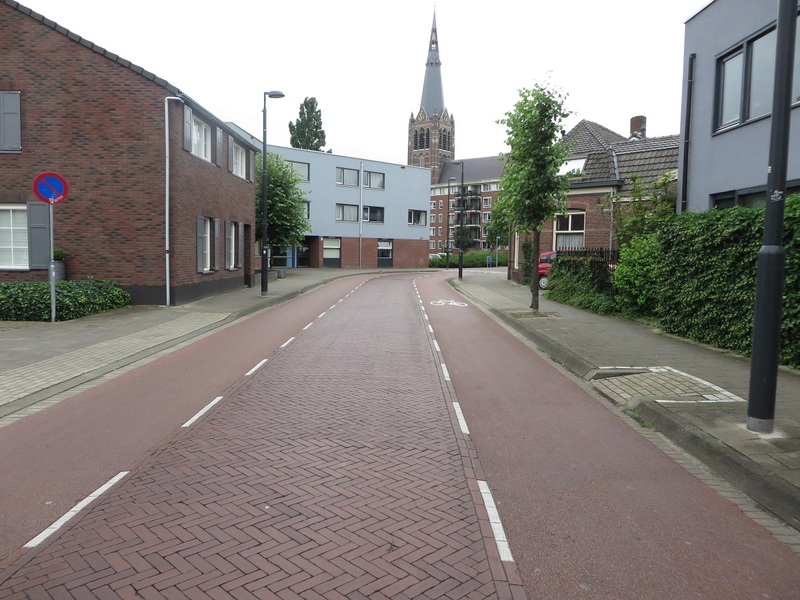 The contraflow cycle track was, however, widened instead. 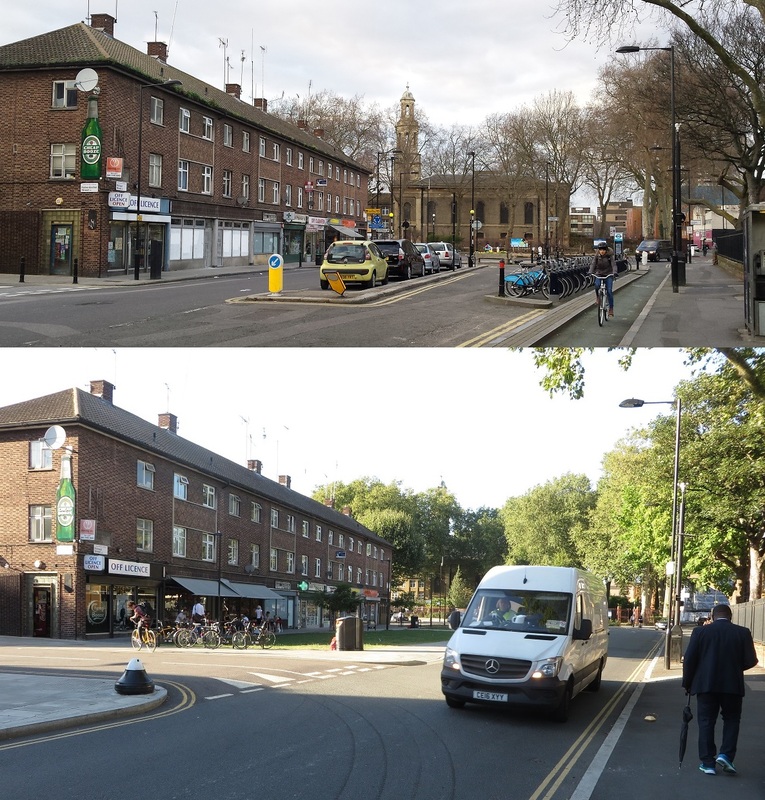 The consultation response states that "The London Borough of Hackney expects to redesign Taberncle Square in the future, although not within the CS1 timeframe." 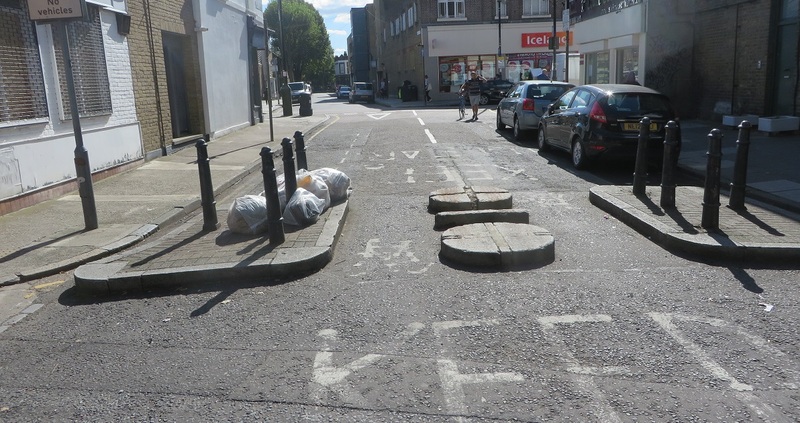 A translation of that is that Hackney Council will rip up the cycle track as they are determined to do this to all cycle tracks in the borough, such as in Eastway and Wick Road. As I said in the post last year this area should be turned into a pedestrianised square, with a cycle track through it, like a smaller version of Haarlemmerplein in Amsterdam. 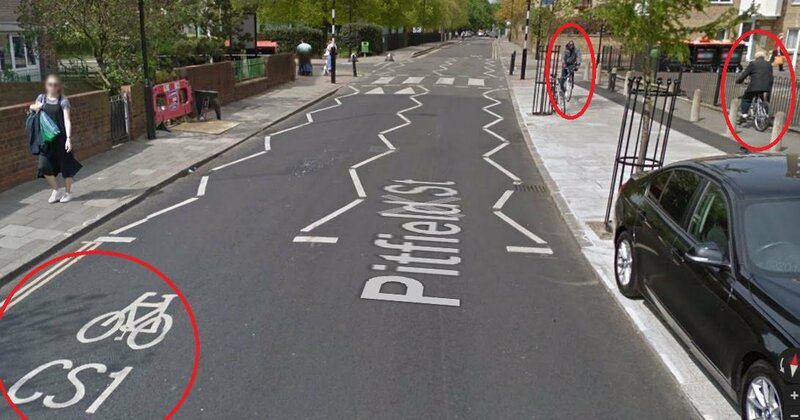 Last year I supported this proposal and stated that this was the only section of the entire course of CS1 where it actually looked like a proper cycle route. I was, of course, being naive to think that Hackney Council would actually go ahead and build what was consulted on and promised. 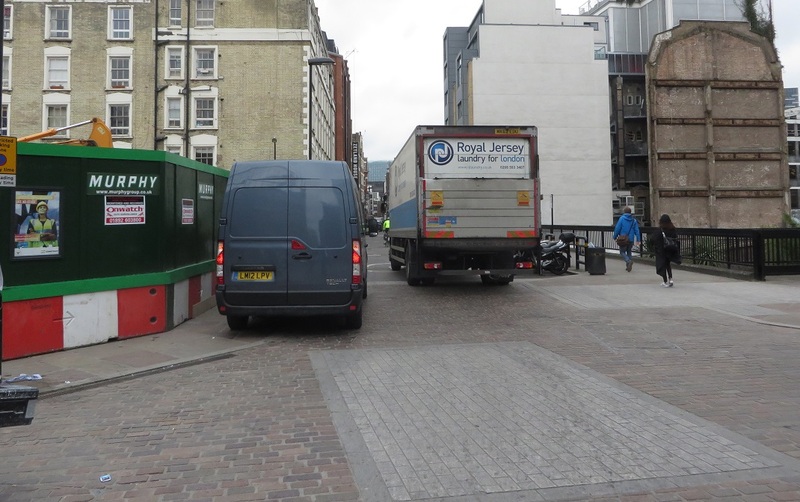 Instead of constructing a clear cycle track through the junction linking Pitfield Street with Paul Street they instead installed some paving complete with dreadful "shared space" signs on them, something that was not in the consultation at all and I would have been very strongly against it if it were! 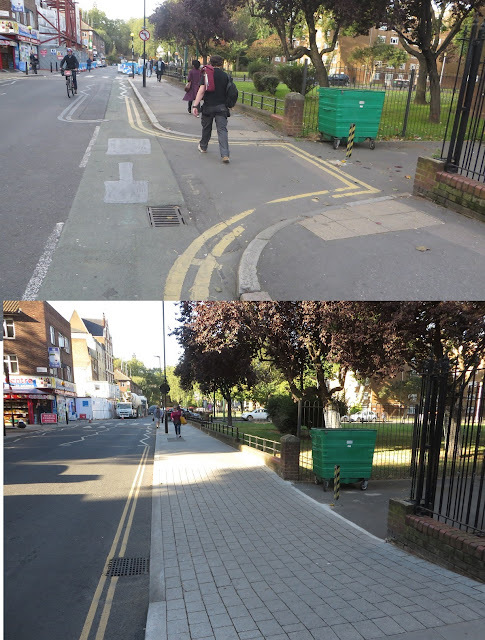 The cycle track had no height difference to the pavement and was almost the exact same colour so most pedestrians did not recognise a distinction between the two and often exclaimed surprise as to why some one was "cycling on the pavement". 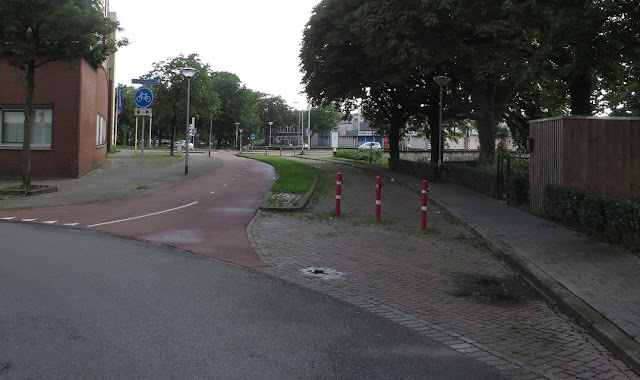 This arrangement was dire for people cycling as well as for people walking. I assume the reason for this nonsense being built was so as a tarmacked cycle track didn't ruin the "sense of place" here, yet there is seemingly no problem with motor traffic having six lanes of very distinct tarmac, freshly resurfaced out of the cycling budget, along with speed limit of 30mph. Why not just make the whole area shared space and have thousands of lorries and buses mix with pedestrians? Because it would be absolute chaos, that's why! The scheme which has been built differs from the visual illustrations which were in the consultation. The cycle track is not distinct in terms of surface colour and cycle symbols at most points and is labelled as space shared with pedestrians. This has caused pedestrian-cyclist conflict and confusion, with many pedestrians not realising that they are on a major cycling route. It is clear in the visualisation that was used during the consultation that the track would be marked with cycle symbols, not shared space symbols. 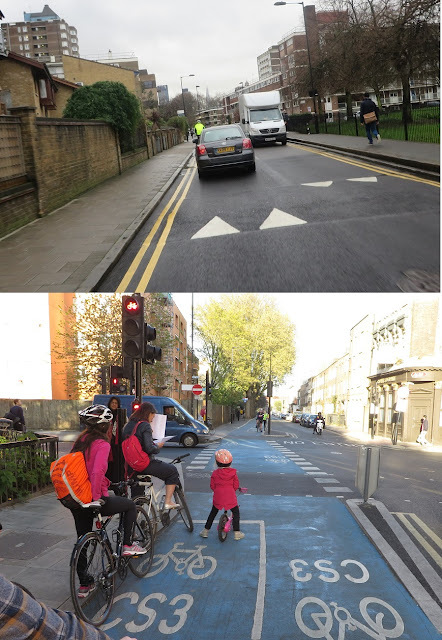 TfL committed to “investigating the technical feasibility of further improving the colour contrast between the virtual ‘cycle track’ and the surrounding footway.” This is technically feasible and should be implemented without delay. Serious questions remain unanswered as to how engineers were allowed to differ so much from what was consulted on and it is an absolute disgrace that public money has been spent on fixing this. 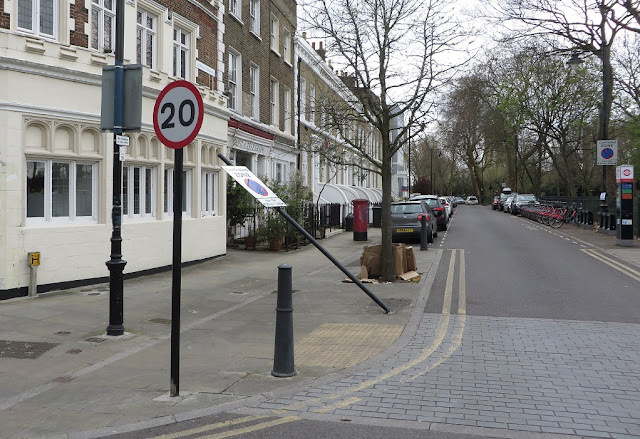 Meanwhile on the approach to the crossing from Tabernacle Square tarmac was used however, despite a promise to removed them in the consultation, the three trees that were there were left in place. In the middle of the cycle track. 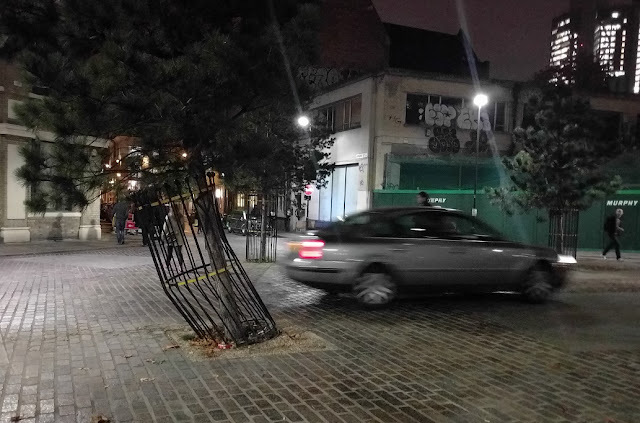 The cycle track was moved and widened but the trees that were supposed to be removed to make way for it have been left there, leaving the cycle track as too narrow. An utterly ridiculous decision, why not simply have moved the cycle track further to the left if the trees were to remain? 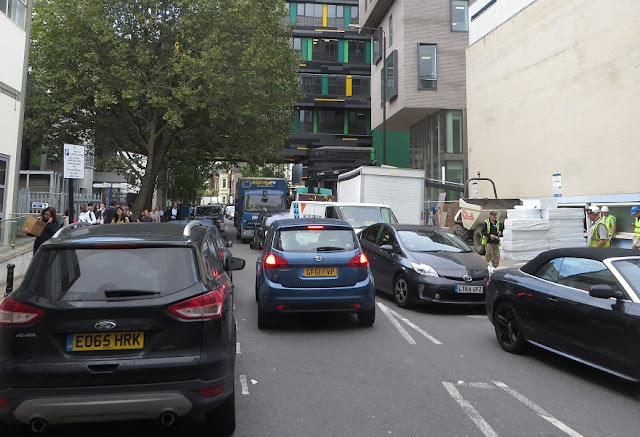 The former Mayor also called for "installation of appropriate and effective vehicle blockage of Pitfield Street" and this does need to happen, but as yet has not. A segregated cycle track does now finally exist on Old Street if you're cycling Eastbound, between the Fire Station and Pitfield Street, but it is only around 50 metres long and so offers only a very brief respite from the appalling cycling environment of this road. 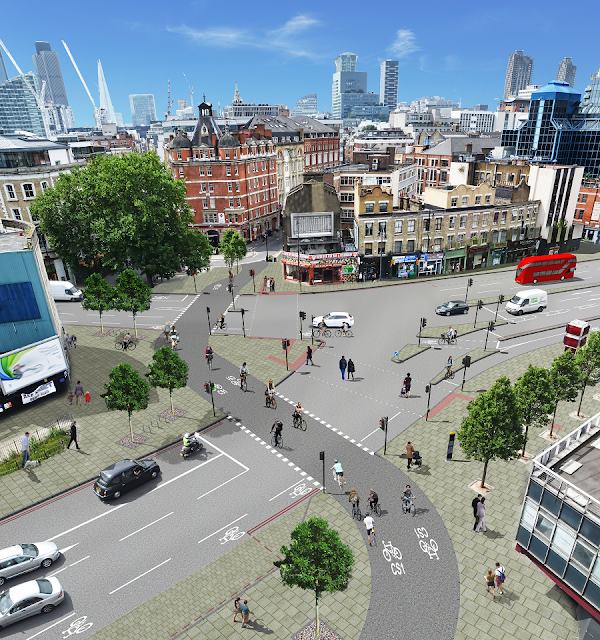 It would be pleasing if it ran all the way from the Old Street roundabout (soon to be removed and gain cycle tracks) to eventually link up with the Clerkenwell Boulevard to the West and Victoria / Olympic Park to the East via Hackney Road. TFL state in the consultation report that it is not possible to include segregated cycle tracks as "this route forms part of the strategically important Inner Ring Road and that segregated cycle tracks would require the removal of general traffic lanes or the cutting back of footway". Old Street here is six lanes wide, whereas the Inner Ring road either side of it on Great Eastern Street and on City Road is 'only' four lanes wide. Meanwhile the six lane section retains either a wide central reservation or right turn filtering lanes into minor side streets, such as Singer street. 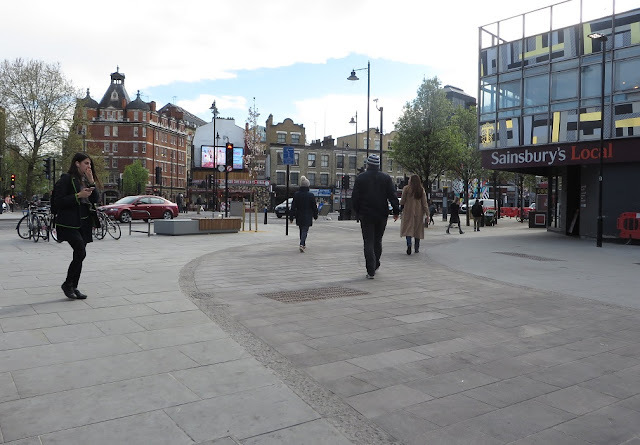 The very first piece of work to take place as part of CS1 last year was to build a "raised table crossing" along Singer Street where it meets Old Street when what they should have done was close it altogether. 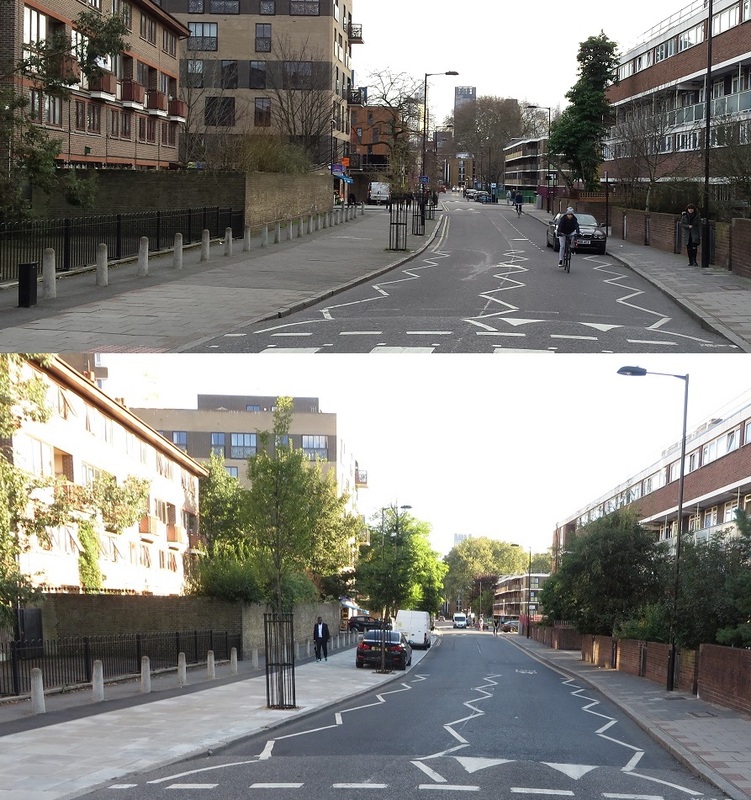 Once traffic enters Singer street it has to turn left and go through the one-day-to-be shared space Tabernacle Square and then more than likely onto the shared space Leonard Square which means motor traffic cannot be removed from Tabernacle or Pitfield Square without extensive work to change the one way system in the entire area. 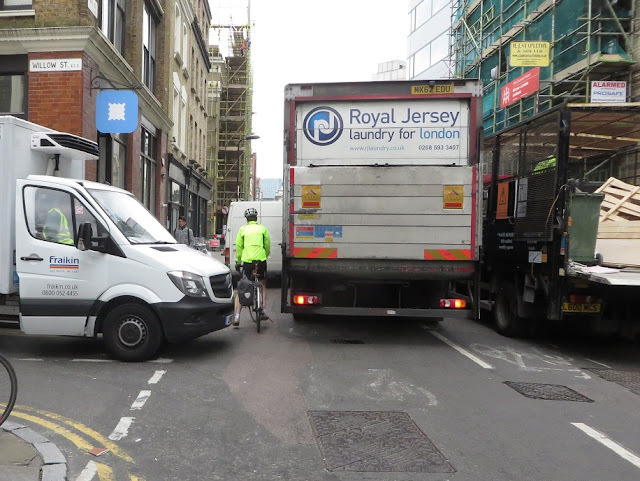 Although it probably suits TFL to keep rat running vans along CS1 and away from the strategically important Inner Ring Road. 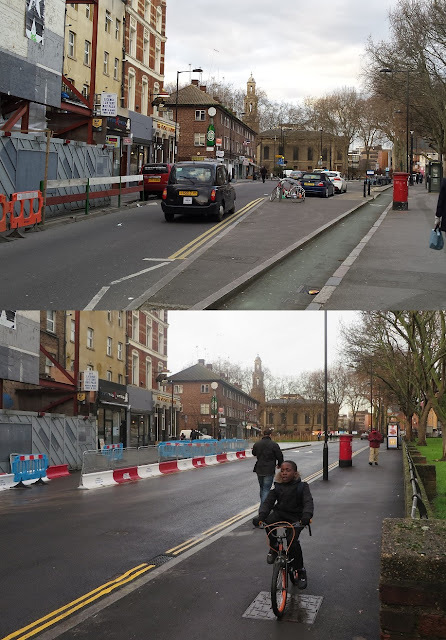 When the original consultation was launched I did not understand how turning Pitfield from one way for motor traffic into a two way road benefited cycling. Now this has occurred I can say with definite conviction that this has not benefited cycling in anyway. Closing Pitfield Street at Old Street has made it slightly quieter in terms of motor traffic northbound but this is mainly due to the ban on traffic tuning right into Pitfield Street from Great Eastern Street. 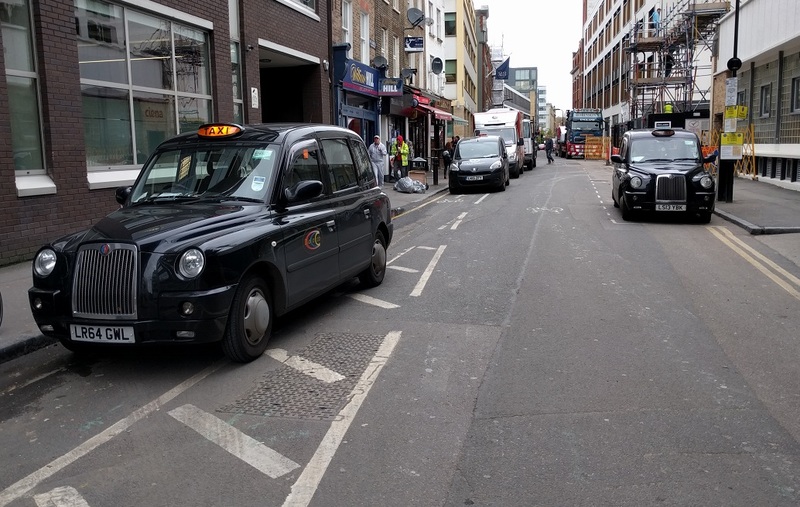 Any traffic on Old Street can still access Pitfield Street by using Boot Street and stand here any day of the week and you'll see a constant stream of Taxis, vans and cars performing this manoeuvre all day long. 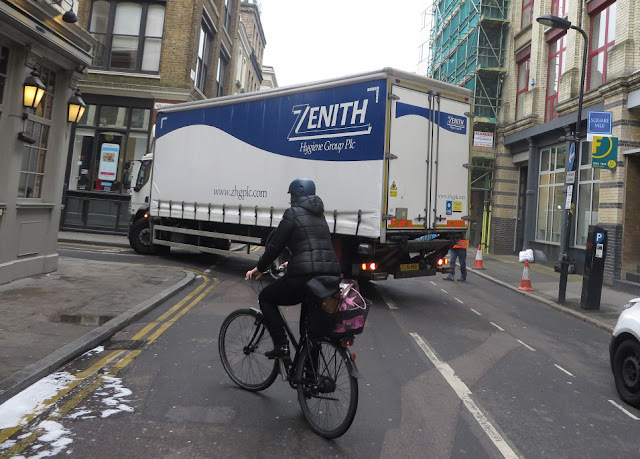 Leon Daniels: "Many existing and potential cyclists are not aware of direct cycle routes along quieter streets, such as the route that CS1 would follow. These plans will provide a clear and safe cycling route into central London"
Surely keeping Pitfield Street one way for motor traffic (whilst also closing the Southern end of it) would have been a way to create more dedicated space for people cycling ? This is past a bin store for a block of flats, a shame this wasn't trialled on some of the side roads. Also disappointing that the pavement slopes down to roadway level to help the refuse collectors who use it once a week! 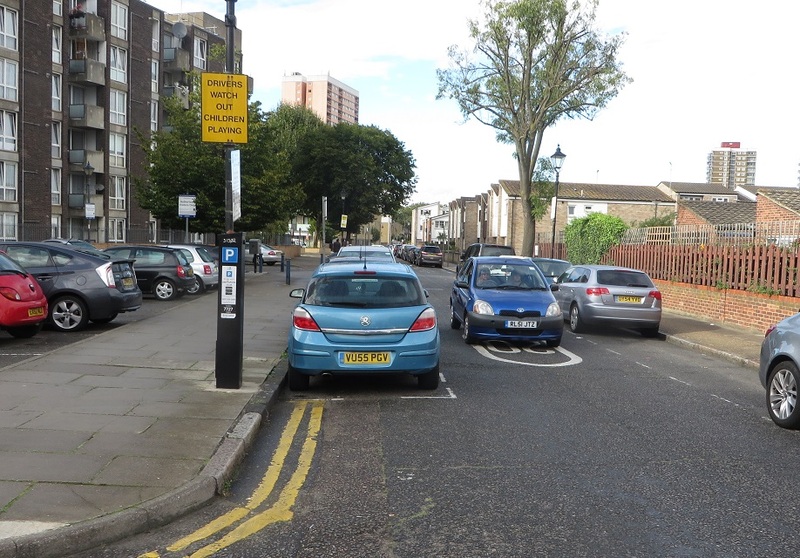 In the post looking at CS1 last year I was very much against creating yet another massive pavement here and forcing cyclists to take the lane in primary position on a narrowed road, with so much space available. I stand by that comment, although the new green space outside the shops is very nice indeed, I can't understand why space was not reserved for creating dedicated space for cycling on the road, with so much space to play with. 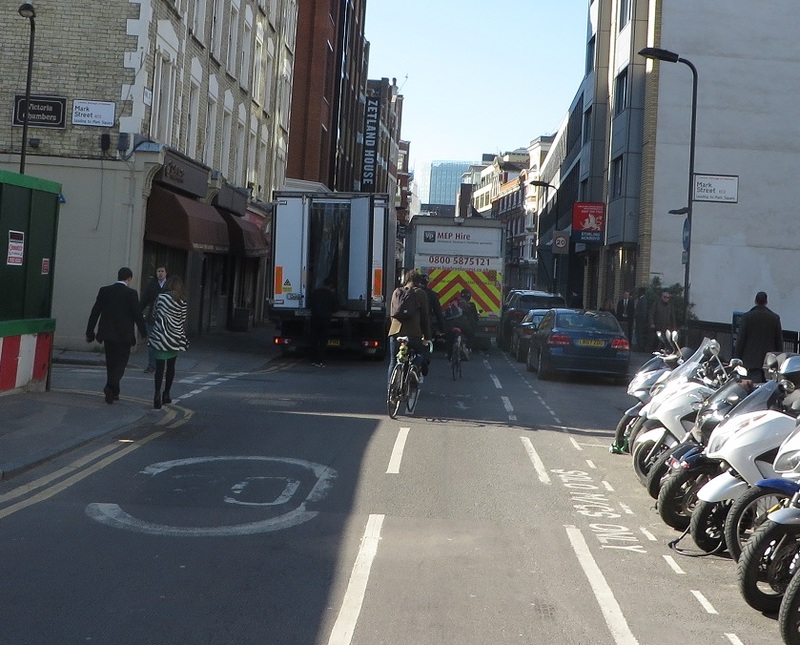 The new arrangement would be fine if Pitfield Street was filtered and was truly quiet but it isn't; this road can still be very busy, especially at rush hour. 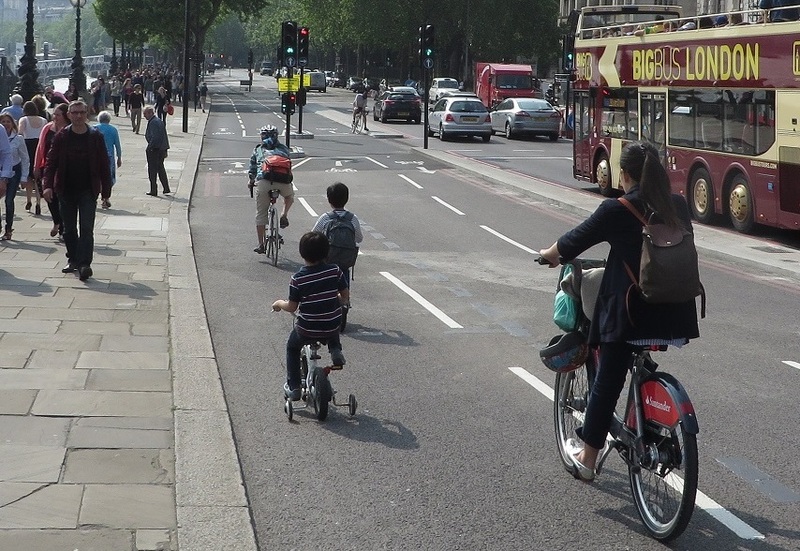 This is one of the reasons I was a bit dubious about the London Cycling Campaigns "mini Holland for every Borough" pledge in the London Mayoral elections. Whilst Waltham Forest are working on some excellent schemes with the funding I fear that if you offered Hackney Council money for a mini-Holland then they would widen a lot of pavements with cyclists left on a narrower road to act as a traffic calming measure, and then label it as a cycling scheme. Will removing cycle segregation and forcing people to cycle in primary position in front of lorries always disappoint? For the vast majority of the population of Hackney it will, yes. 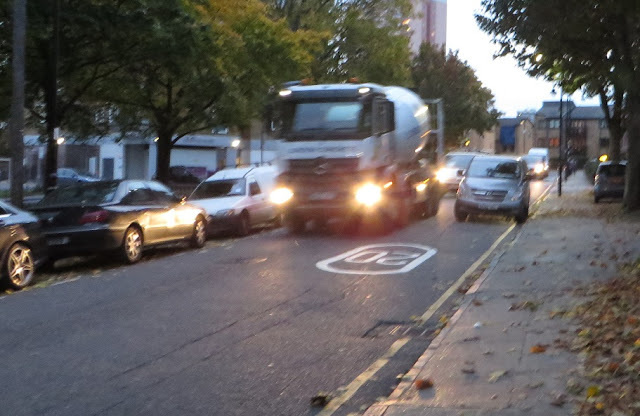 This is one of the worst sections of the entire route of CS1 to cycle along. It is absolutely dominated by motor traffic travelling through here all day long and no measures were ever planned to change this. 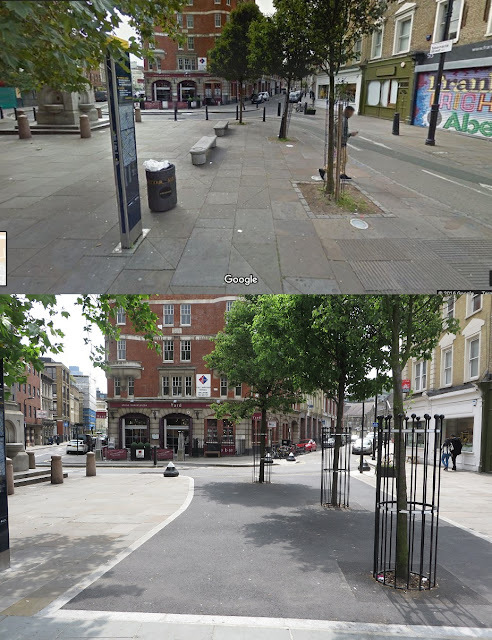 All that was offered here was a very slight reduction in parking and some cycle wayfinding signs. before and after the superhighway; the cycle symbols have been removed and replaced by cycle symbols a metre further away with "CS1" written underneath them. Councillor Feryal Dimirci: "This will be the first time in London that we will be creating a safe haven for cyclists and pedestrians over so wide an area"
Whilst Hackney Council do offer free cycle training they, just like TABS, are clear that this has limitations and many people are unlikely to cycle in these conditions, trained or not. The new speed humps have been built with a smoother shape and are fine to cycle over but the reason they exist here at all tells you that this route is simply not suitable to be a "Cycle Superhighway"
Mark Mascar, CS1 project manager: “CS1 is a great opportunity for people to ride and walk safely in an environment that is dedicated for them and away from traffic on some of London’s most congested roads." Boris Johnson: "This Cycle Superhighway will provide cyclists with a direct, protected route along quiet streets, making it even easier for people to hop on a bike rather than getting in their cars." 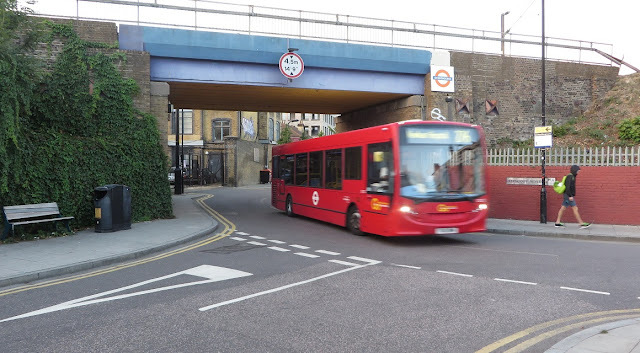 Phillip Glanville, Hackney Labour Mayoral candidate: "some of our roads are too narrow to provide segregation, high quality public realm, and sustain bus times. 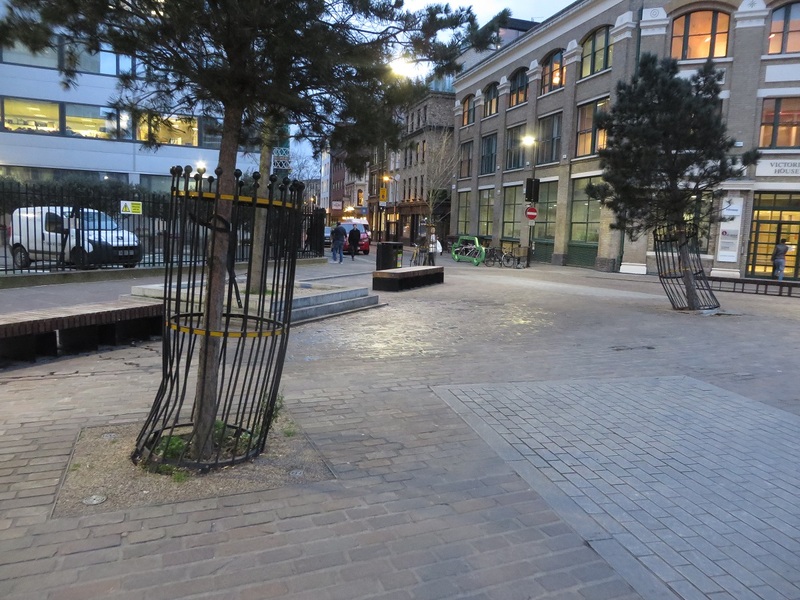 But where there is space let’s use it to improve the space for cycling and pedestrians, some of our best schemes like Pitfield Street do this, but I know there are still obstacles on these routes." anytime I see a child cycling here it is always on the pavement and I don't blame them, this road just is not safe enough and it carries far too much motor traffic. 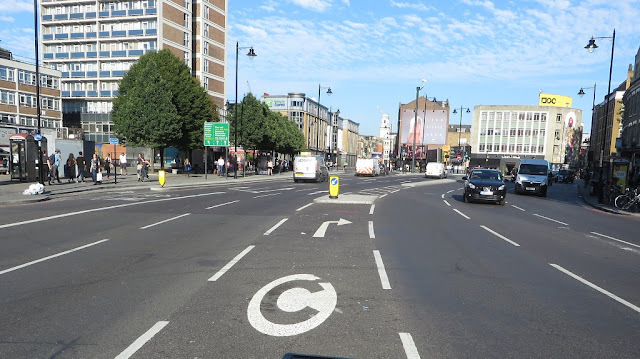 At the point where Pitfield Street becomes Whitmore Road we come to a crossroads, known locally as Britannia Junction, where Cycle Superhighway 1 meets LCN+ cycle route 16. 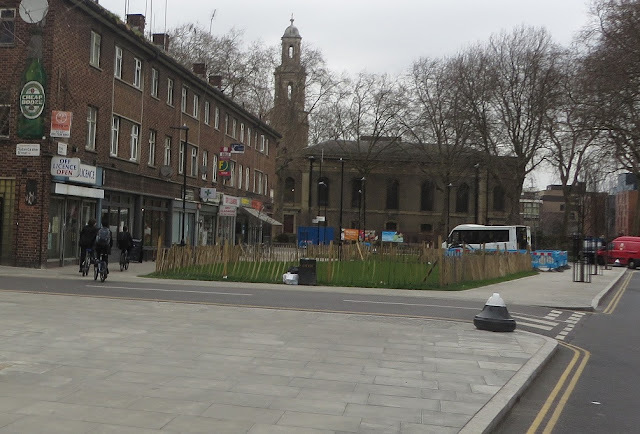 No changes were planned here as Hackney Council spent £600,000 removing the roundabout here five years ago, compete with mammoth unused pavements and forcing cyclists to ride in a central position on a narrowed road. 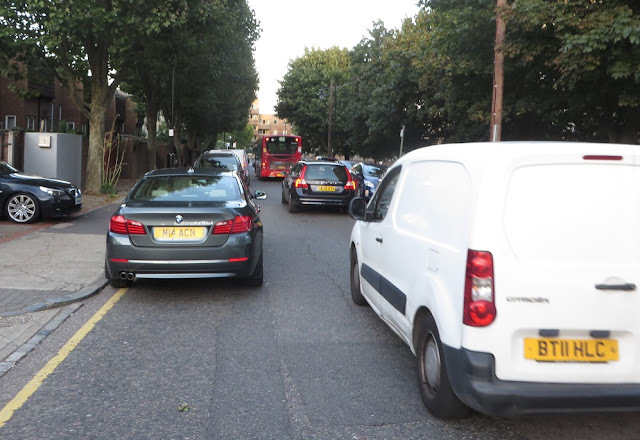 This was despite there being plenty of space available for cycling infrastructure and (although both being labelled as cycle routes) these roads being exceptionally busy with motor traffic. In the three year period after this boondoggle project was created statistics show that this was the most dangerous junction for cycling in Hackney, with more than twice as many cycling casualties occurring here than at any other junction in the borough. 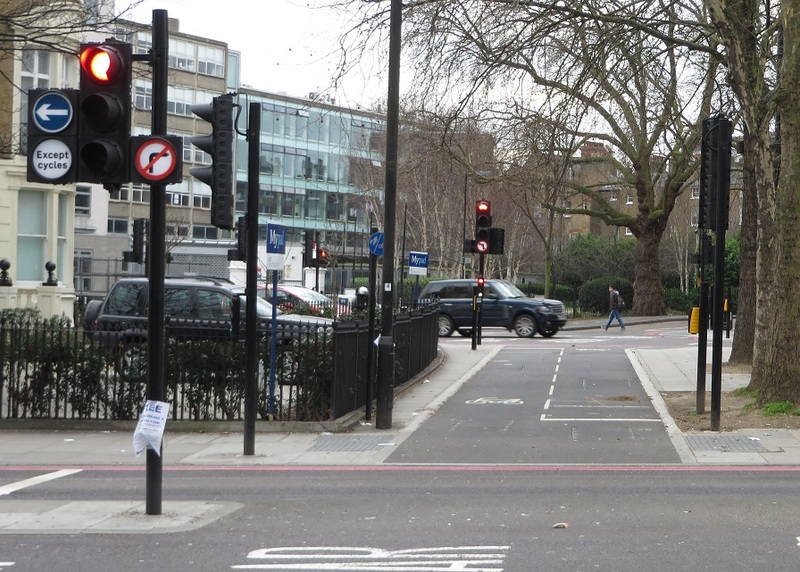 The Times also reported that this was the 7th most dangerous junction for cycling in all of the UK. Ideally the crossroads here should be removed and replaced with a roundabout, with segregated cycle tracks on it rather than creating a vanity project which focuses on places looking pretty being more important than ensuring people travelling through those places are safe. North of Britannia Junction and they drilled down to the old cobbles here to resurface it, reshape the speed bumps and paint CS1 and parking spaces on it. 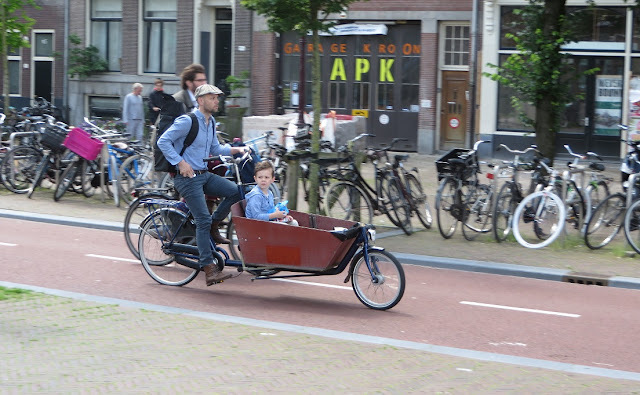 The problem is it is still dominated by motor traffic and so children cycle on the pavement, where they are safe. I also suggested that the Georgian Whitmore Bridge should have painted cycle lanes on it with cars giving way to each other but that never happened and so parents with children cycle on the pavement here instead. The only way to make this section safe and inviting for anyone to cycle on would be to turn the whole stretch one way for motor traffic to create dedicated space for cycling or close around 20 roads to through traffic. 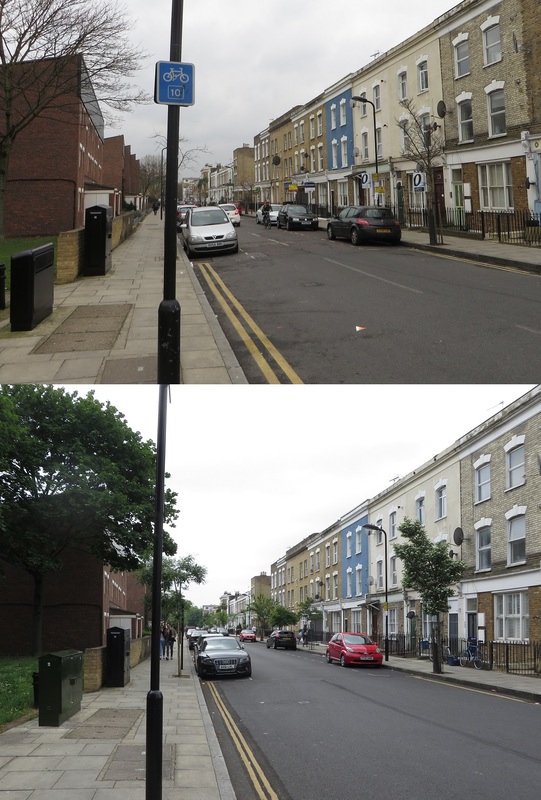 The improvements planned for De Beauvoir Road at Northchurch Terrace have not happened. 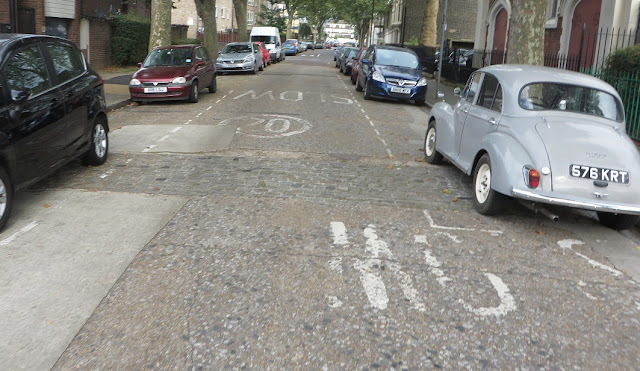 Once CS1 turns left into Northchurch Terrace conditions improve hugely and this is the only section of CS1 that is truly suitable for anyone, of any age, to ride a bike. The reason for this is due to over half a dozen filtered roads keeping out through motor traffic creating an almost car free area. These roads have all been closed since April 1974 following effective campaigning from local residents and I've written how the closures came about here. 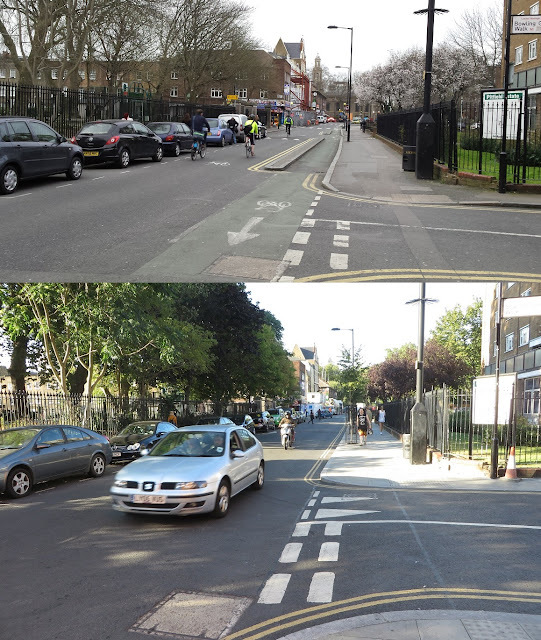 The Culford Road / Englefield road junction was another part of the scheme that was used as a visualisation in the original consultation. However this junction does not look anything like this as no works have taken place on it and so it remains a very awkward junction to cross on a bike. TFL stated in the consultation response that "we are further evaluating the the merits of the current proposal compared with alternative design solutions, with a view to providing a solution that benefits cyclists and pedestrians, while also accommodating the needs of local residents". In my post last year I welcomed the filtering of Ardleigh Road but stated that with no filtering of Culford Road I was concerned that this scheme would actually push more motor traffic onto CS1. 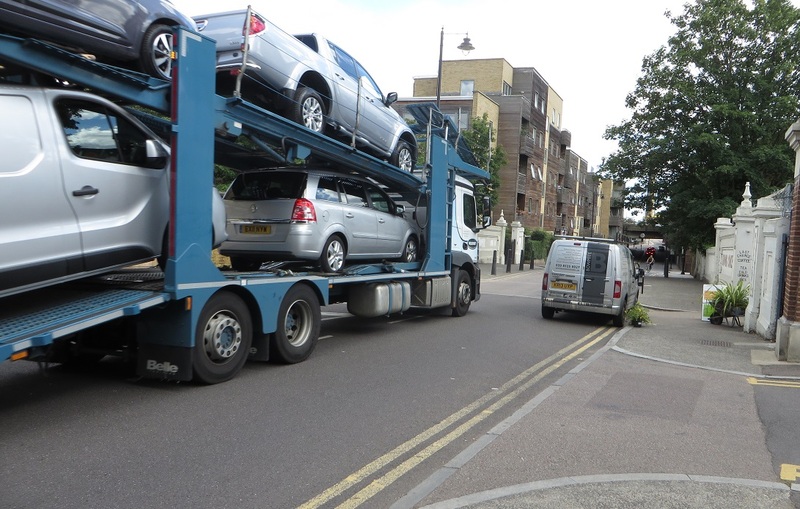 I was therefore delighted when TFL launched another consultation shortly later which proposed not only filtering Culford Road but also several other roads in the area to make the Northern half of De Beauvoir Town free of through motor traffic, just as the Southern half has been for over 40 years. I was a little surprised to tune into the local TV channel London Live one morning after this consultation was launched to hear two local residents both arguing against this scheme due to the restrictions for their car journeys. One of the residents even complained that this would cost her more money per year as she would have to use more petrol to drive to her house! "Homes before roads". 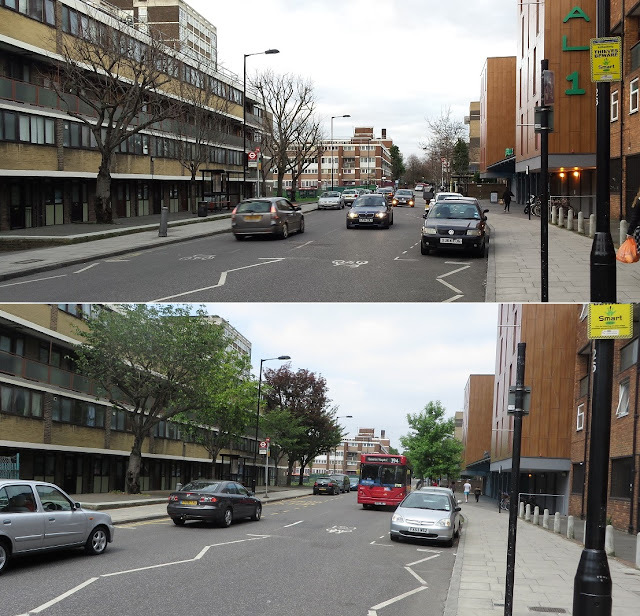 Members of the De Beauvoir Association campaign for Tottenham Road to be closed to motor traffic in 1975 and the same view today. As for impact on surrounding roads with displaced traffic causing congestion or additional pollution the closures will go in under an 18 month experimental traffic management order so this can be monitored and closures either revised or removed if there is significant impact. 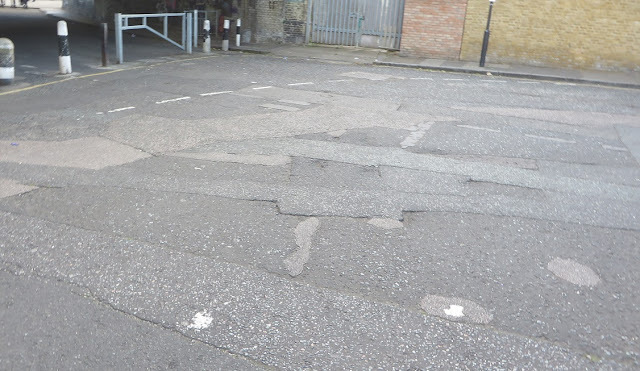 This also occurred in 1974-1975 in the Southern half of De Beauvoir Town before the closures became permanent so hopefully this can be a standard procedure when further area wide filtering is proposed anywhere in the borough in future. The public opted for Option B on Balls Pond Road; a bidirectional segregated cycle track running from Culford Road to Kingsbury Road. A year and three months on from committing to this (subject to technical and operational feasibility) and nothing has happened here. 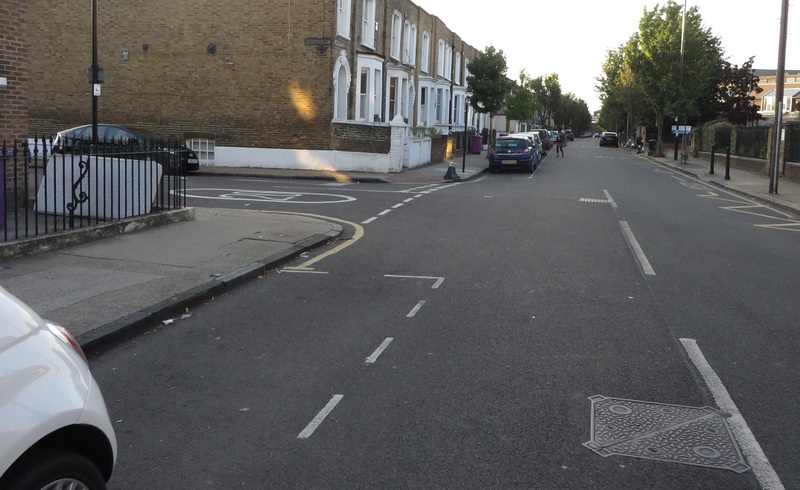 A bidirectional cycle track along Edward Street on Quietway 1 via The Ranty Highwayman - why has a similar layout not been built on CS1 yet? Local residents campaigning in the 1970's for a safe pedestrian crossing on Balls Pond Road for their children and the same spot today where a crossing now exists. A cycle track should also now exist here to allow children to safely cross by bike but as yet has not been constructed. 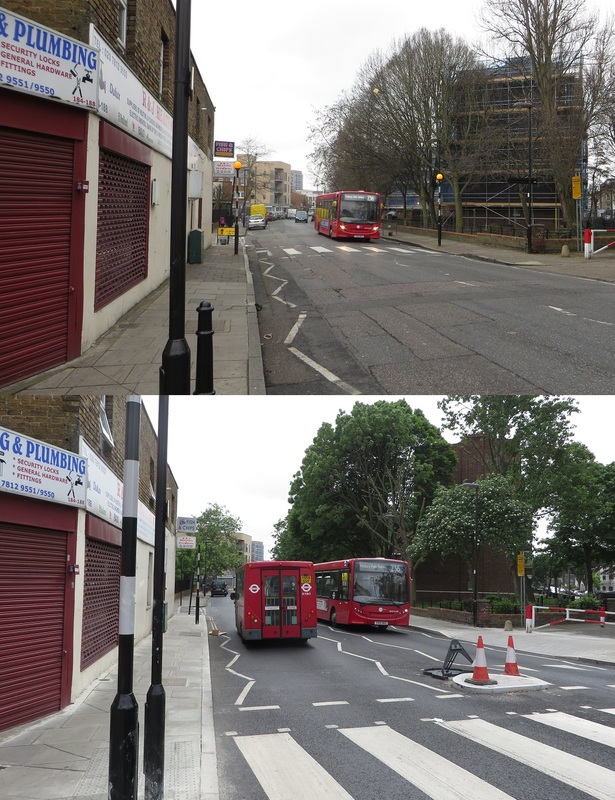 Wordsworth Road has not been closed at the junction with Boleyn Road as was planned in the original consultation. In the consultation response it was reported that "The London Borough of Hackney will investigate a scheme to reduce through motor traffic from surrounding roads, and make the wider area more cycle-friendly. If an area-wide scheme is not achievable within CS1 timescales, the current proposal to make the junction of Wordsworth Road and Boleyn Road cycle-only will be implemented." "Wordsworth road is a busy rat run and whilst the closure of the southern end of the road may help reduce this, traffic can still use it as a through route from the A10. Therefore Bennett Road should also be closed to ensure this can no longer be used as a through route. The roundabout should also be removed"
The vast majority of Cycle Superhighway 1 in Hackney is not suitable to be called a superhighway. In fact most of it is not suitable to be called a quietway; how can a cycle superhighway contain so much motor traffic and have so many speed bumps? There is absolutely nothing super about it at all. It continues to amaze me that something like CS1 in Hackney and CS3 in Central London are two of the same thing; CS1 feels like the past and CS3 feels like the future. 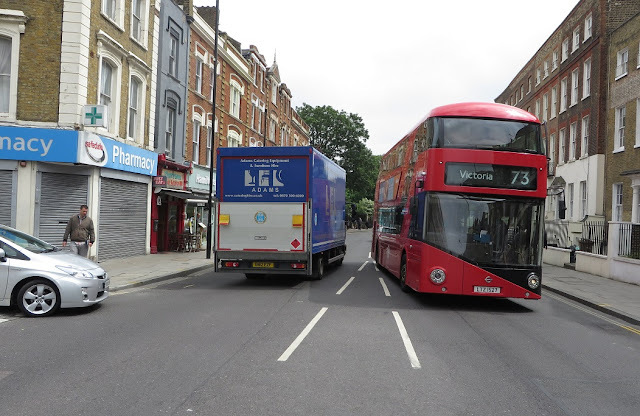 Transport for London commented on routing CS1 away from the A10 in the consultation response: "As stated in the Mayor's Vision for Cycling, Cycle superhighways need not run along busy arterial roads. 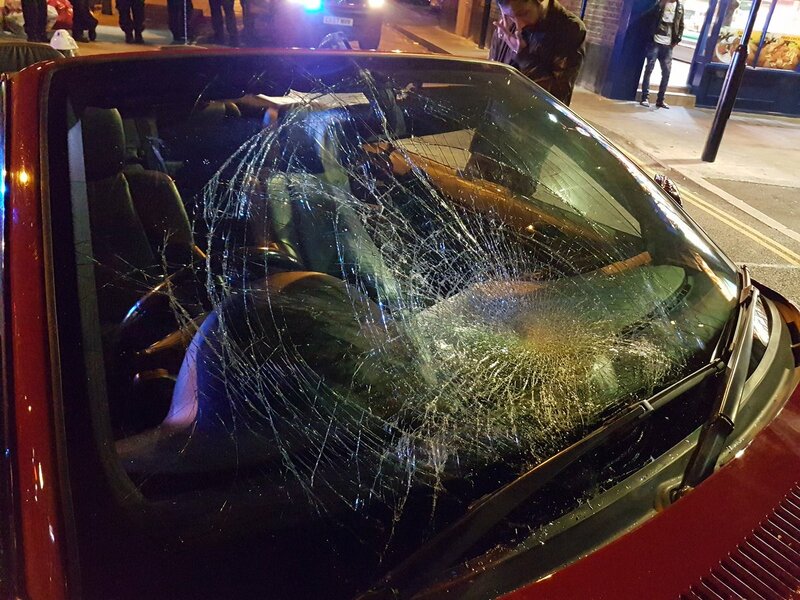 Alternatives should be considered if they provide cyclists with a good level of service, as they do in this case. 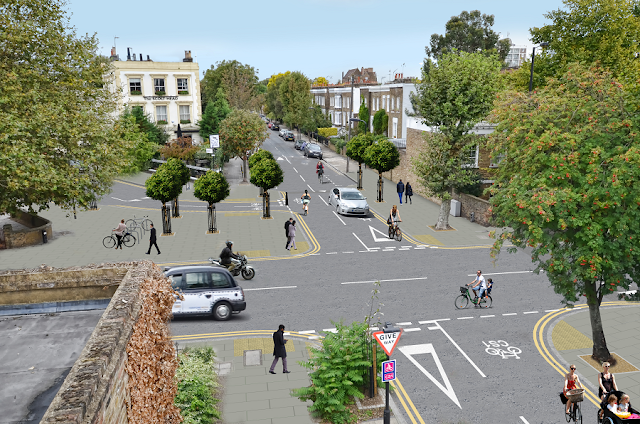 We are confident CS1 will provide an inviting and pleasant cycling environment for existing and, crucially, new cyclists. 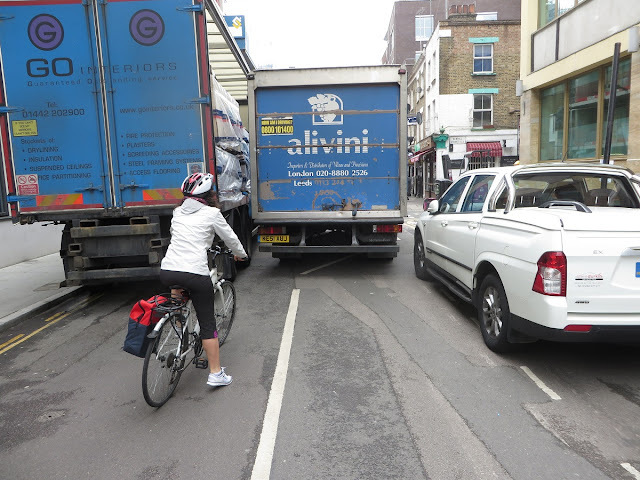 This supports the Mayor's strategy to normalise cycling in London. Perhaps the most successful section of existing superhighway, CS3 between Tower and Poplar, runs on side streets." 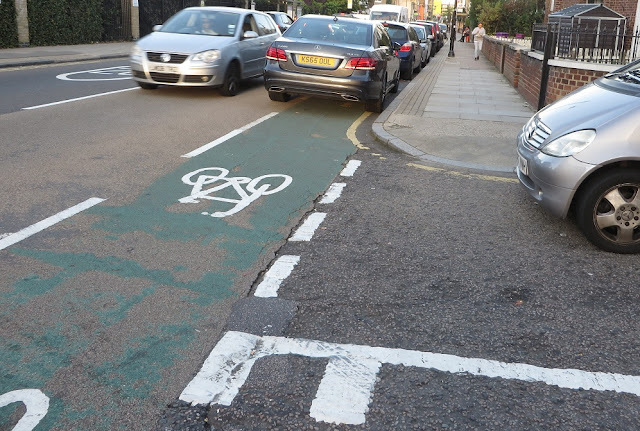 CS1 and CS3 along side streets. Which would you prefer your children cycle on? 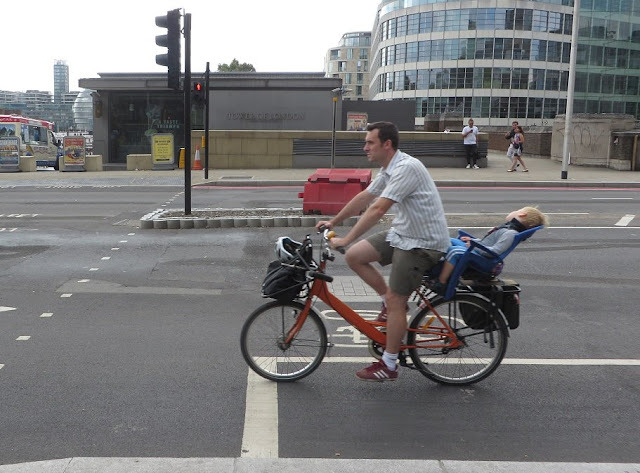 I've cycled from Mile End to Buckingham Palace at the weekend with my four year old along CS2 and CS3 but I wouldn't cycle along any of CS1 with her despite the fact she went to nursery right alongside it for a year! 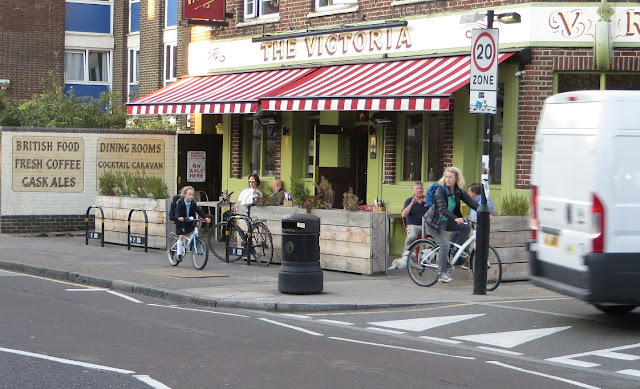 As long as Hackney continues to focus on cycling infrastructure which only suits fast, confident adult cyclists then the growth of cycling in Hackney will always be limited. I don't want to be fast when I'm cycling with my daughter; I want to be safe. CS3, CS6 (and most of CS2) manage this. I only used CS1 after dropping her off as it was the most convenient route into Central London, now she goes to school further East I'll use the A10 instead. 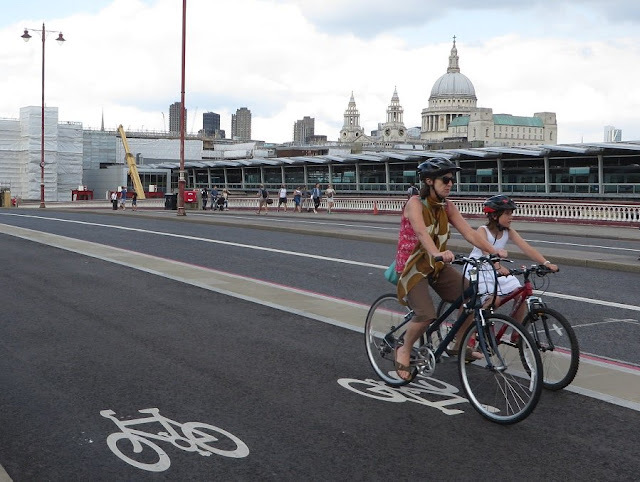 Cycle Superhighway 1 should be on the A10 as that is the most convenient route for most people. It would link Tottenham, Stamford Hill, Stoke Newington, Dalston, Haggerton and Shoreditch directly with the city and pass the main shops and busineses that people want to visit along the way. It could continue down to London Bridge and link up with CS3, forming a grid and truly making Hackney a cycling borough. 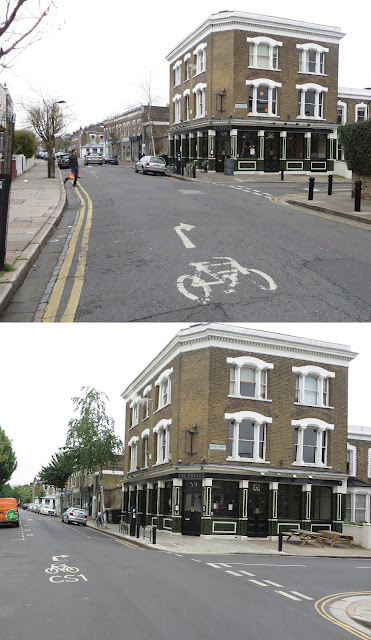 Tweaking decades old back street cycling routes will have little effect on people taking up cycling and continuing to ignore the A10 will mean it'll remain the most dangerous road for people on bikes in Hackney. 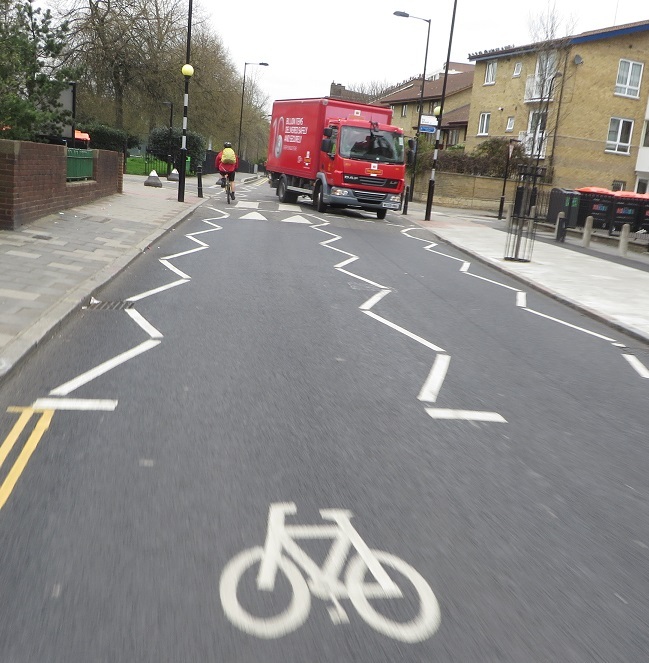 Anna Hughes has also written about CS1 in her blog here. 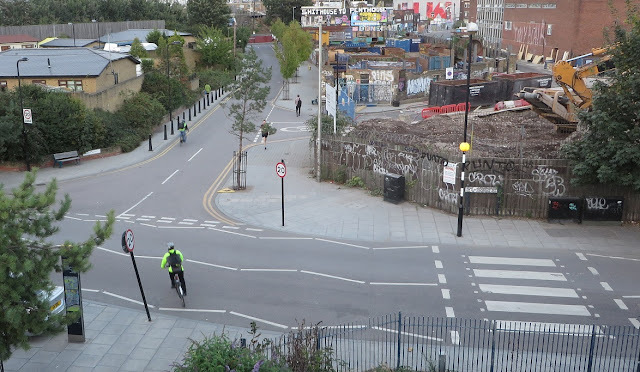 Michal has uploaded a video of him cycling the entire route of CS1 here.